You can purchase the complete ScreenSet by pay with Paypal, Visa or other cards by Press Buy Now. After paying and check out you will be Redirected to a download page. If you somehow mis the download page, just send a mail to pbj@oncable.dk and you will get it. Is best read by scrolling down from start to end. But Note if you use Link you still have to scroll, many Chapters is longer than one screen image. I'm glad finally to be able to present my new ScreenSet which I worked on for the last 12 months. I have received a lot of positive feedback for my previous ScreenSet (PBJ-Screenset 2012) and been in a constructive dialogue with both major production companies, Artists, Hobbyists, etc. and received many proposals and wishes for my next ScreenSet I have in this ScreenSet tried my best to accommodate as many as possible. And I'm very happy with this new Multi Interface ScreenSet and is pleased to present the many new features and screens there are described down after.This site is both Introduction, Manual and Documentation so it is a bit extensive and goes into the details. So do not be confused by the extensive documentation You can easily start using Mach3 standard features, and later in your speed use more of the new features. For Touch Displays from 7" and up to more than 24". by using finger and even smaller if	using pen (phone size). Consists of 10 different native resolutions from 800x480 to 1920x1080. Crystal Sharp Graphics. Each Set Consists of 26 pages/Screens, More Menu based, more simpel to use, easy navigation through main menu. 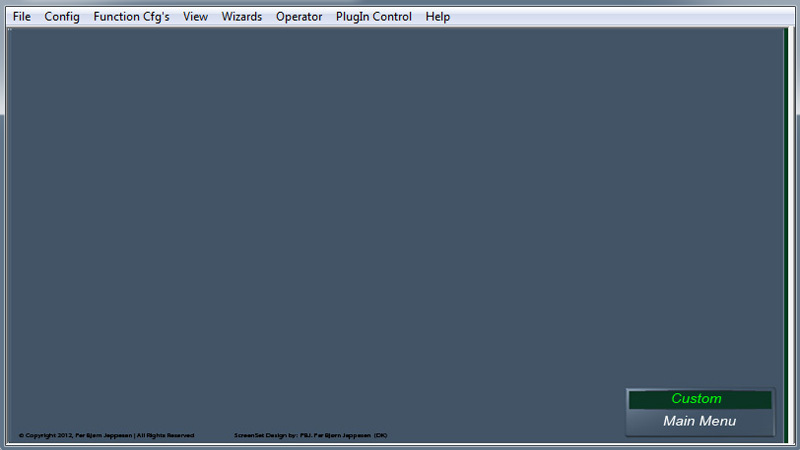 All run functions is on one screen, all load functions on one screen, feed, tools, spindel is on one screen and so on. Easily view due to color division and functions division. Multi Interface Touch, Mouse, Keyboard. Contains all MACH3 standard features and Includes many new features. 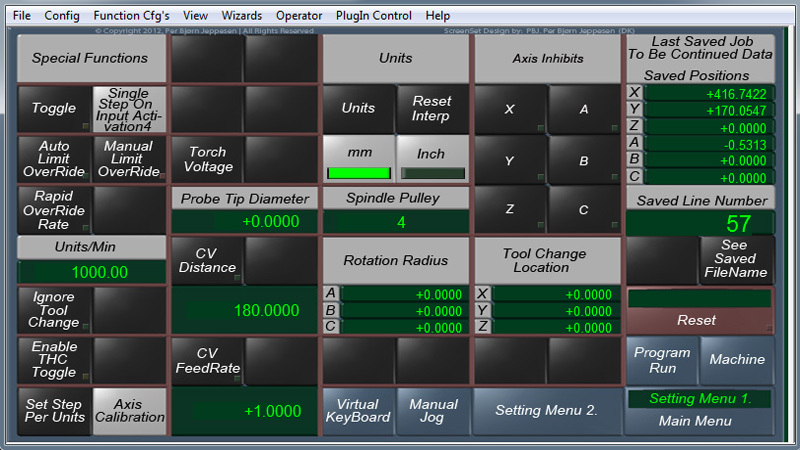 And there is all you need for using touch displays: ToolPath Navigation System Move, Zoom, Rotate(Orbit) with your finger in the toolpath display. 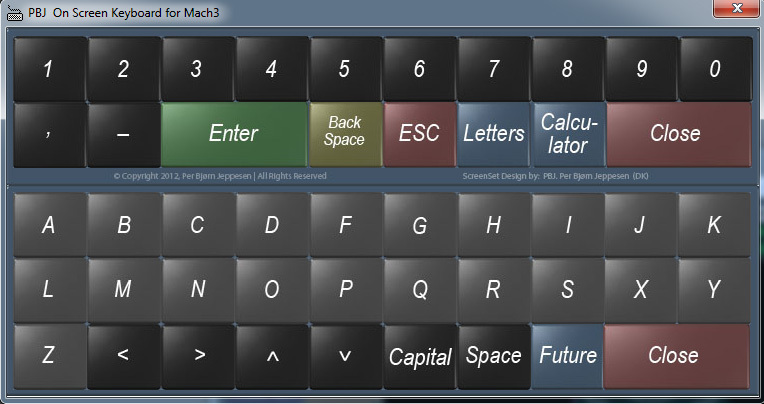 Virtual CNC Keyboard Numeric and Letters and a Calculator. Start your profile directly no need for MACH3 loader list. All buttons is same size and easy for touch. Many tools for navigating your machine, a very simpel manual jog flyout for live jog all six axis and a panel for move this distance, for all six axis and a save and go screen with 8 memories for all 6 axis. There are tools for all kind of ToolZero both if you already have at ToolZero Switch and If want a good system. There is a Large switch guide, ideas for how to build you own switch from no cost to more complex switch ideas. There are three screens containing toolzero. First a manual / semi-automatic system to reset the tool relative to the material or part for all 6 axis. And then there is a system for reset tool XY relative to a fixture and homing switch. And if you switch toolbit manually in the spindel motor	for each tool change there is a Fully-automatic tool control system for tool reset of Z-axis with 4 different methods/macros so all switching systems are covered, using several toolbits is now a pleasure, and you do not have to think "it's easier to do it all with the same small toolbit" with consequences that the job then take years. 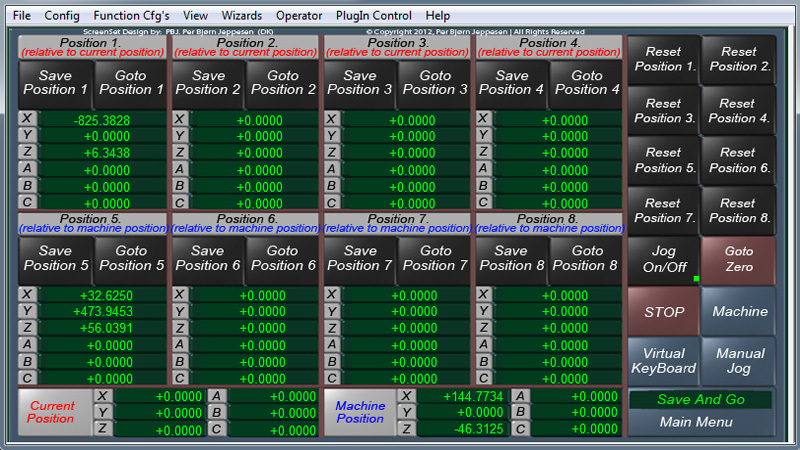 Then there is a Speciel Machine screen with a more graphical view of all axis and a Speciel fast homing system. There is also a good system "stop to be continued" where you at any time in the middle of a large job just press a button to stop the machine and everything is saved and for example next day with a few button presses can continue from the exact same place where it stopped. And there are many small handy features like a button on main screen for opening at text file for your notes it always open the same file so you always have your notes close to hands. There are Quick Setup which is a shortcut through menus for quick setup. There are buttons for output on run screens and input led good to manually start the spindle, pumps, etc. 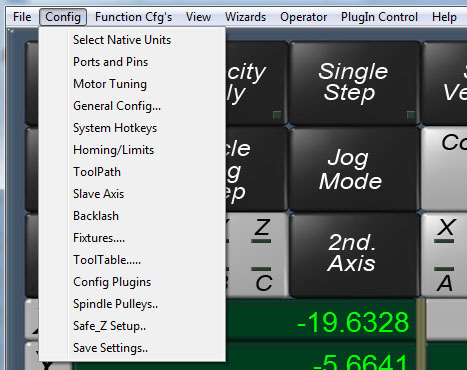 There is a button for Zero all machinecoords good for offline testing where toolpath easily comes out of focus. With lost unit, you can see your machine accuracy and detect future wear or slope. This is the first screenset makes it possible to navigate MACH3 100% by touch and it is the screenset with most resolutions or sizes. There is something Both for Professionals and Hobbyists. But check out the website here are all described very detailed. If you install this new Screenset/Interface you can still easily switch between this ScreenSet and Mach3 Standard ScreenSet. you can easily switch to the familiar standard screenset environment and at any time back to the new ScreenSet. How to switch between ScreenSet can be found in the chapter "How to switch between ScreenSet in Mach3:" on this page. a lot of new features and screens that are documented on this page. It is also important to state that this ScreenSet is integrated directly and correctly into MACH3 there is no "in between software". Both Codes and ScreenSet layouts are 100% Customizable. To Customize Screenset Layouts use eg. PhotoShop. To Customize Functions use eg. Machscreen. 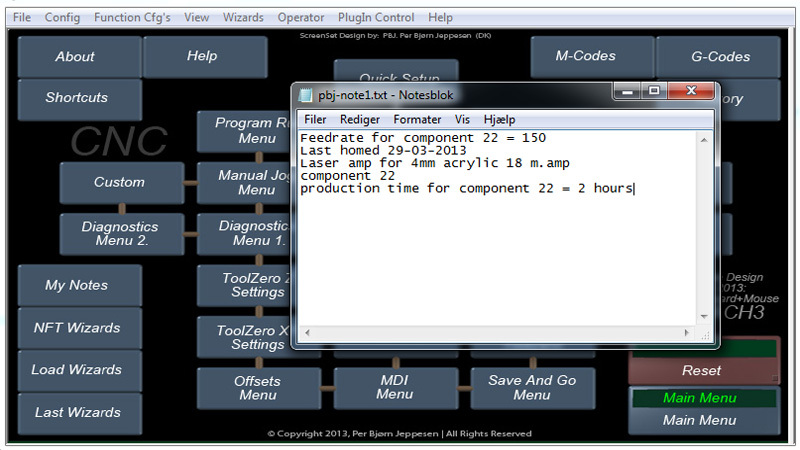 To Customize Codes use VB Script Editor which is integrated into MACH3. All code is kept very simple not necessarily short but in a very simple language that makes it transparent for most people. Settings and positions and other to be saved will be saved in dro's and not in text documents which means that it will be saved in the profiles so you can have different settings of other profiles. The ScreenSet design is by P. B. Jeppesen Denmark. The colors on this ScreenSet is divided on a psychological way so you get a quick and clear overview when you know the division. All Black Text on white background is informational only, that is not something you can click or activate. 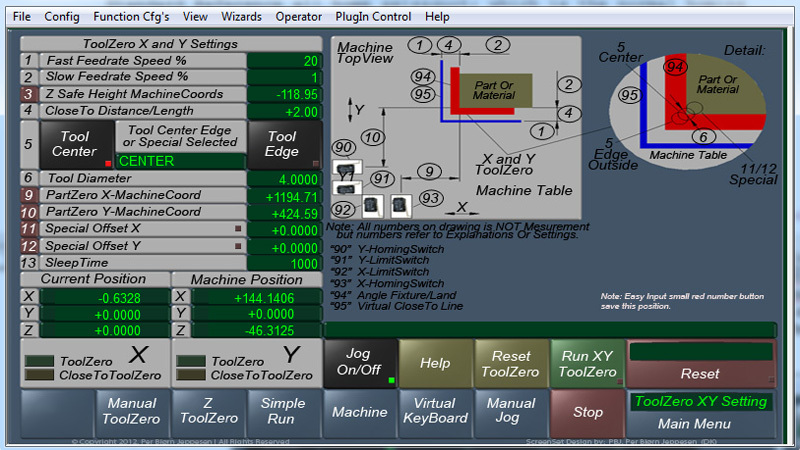 All with White Text are buttons that can be pressed, and here are the colors of the buttons themselves subdivided as follows: Green is starting functions, Red buttons are buttons that require more attention, Yellow is hold functions or offline, Gold is the new features Toolpath Navigation, Purple is general Toolpath navigation, Blue buttons are links to other screens, Darkcyan is output toggle and Black all other general functions. All Led are made on white background with black text instructions. Note: Menu or Page or Screen is the same. ScreenSet I have made in 10 different resolutions, this also means that ScreenSet looks a little different in width and height in the different resolutions. Below are screenshots of the various shown on a large screen. Please se also the chapter Display size for more info. I have been asked by many both professionals from companies and hobbyists when there will be a ScreenSet for touch displays so you can operate machines from a touch Display, for many different reasons. For daily operation, it is more practical as the clumsy Computer, Monitor, Keyboard and Mouse can now be stored away, touch display can be placed much more handy, so you are close to the machine, and better follow what happens mechanically and then even have all functions at your fingertips, and only focus on two things namely Machine and Touch display and NOT 4 things Mouse, Keyboard, Display and the Machine. This is also the original way of operating large CNC machines in, with small displays. But with MACH3 and the many more possibilities PC provides both function wise and graphically it's all taken a step further. This I have learned also is great for small machines for hobbyists, you can still have a keyboard and mouse hooked up. So you can experiment or make special settings, or test, if you feel most comfortable to sit concentrated in front of the computer and then only use the touch screen to the final production / manufacture or use it as an advanced remote control, the possibilities are endless. You can also connect a touch display for the Machine Computer and drawn a touch display into the office and from here while working on the ordinary PC keep an eye on the machine and even operate it from here and maybe with a webcam. Some have also pointed out that the presentation of their company will have a more professional look with a touch display. A navigation system that makes it possible to set a drawing correctly in ToolPath display only with one finger. A numeric virtual keyboard, which must match the rest of the layout and allows you to enter numbers in Dro's. An Alphabetical virtual keyboard where you can enter letters in	MDI. It had to be built up so it was possible to operate even with small touch displays in high graphic quality and it should be possible to operate with a finger and not only with a pen. There had to made a good and simple manual jog system that you could use from all screens. It should also fit multiple resolutions and screen size. First, we take a look at the new menus / screens. There is created a new screen called MAIN MENU reason for this is to make all other menus / screens more simple so they are not filled with unnecessary and confusing link and make things more manageable. Which also gives better opportunities for touch displays, when the number of buttons on the individual screens are minimized and the remaining can be made larger. The main menu can be reached from all screens. In the lower right corner of all screens is a button labeled Main Menu This is a link to the Main Menu and a small display that shows which screen you're on. Another button RESET are of course also on all screens this is also made with a small display with status information as well as a small red led. A Small handy features is a button on main screen for opening at text file for your notes, it always open the same file so you always have your notes close to hands. On the main menu there is a link to Help menu that opens this entire manual which is the same as the one on this page but it is locally stored in screenset package so you do not have to be online to reed this, however it is a good idea once in a while to check out this online page for updates. In some of the new screens eg. toolzero there are link to help only concerning this. Quick Setup and Next, is a 4-step shortcut when you press Quick setup takes you to the machine page to position the machine and when you press Next takes you to the Load page so you can load a drawing and when you press Next takes you to Feed, Tool Spindle Page and finally, when you press Next you come to simpelrun menu. 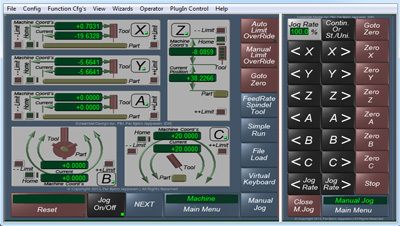 In my first ScreenSet package (PBJ Screenset 2012) I learned that many were happy for a ManualJog system which we can easily jog with all six axis. 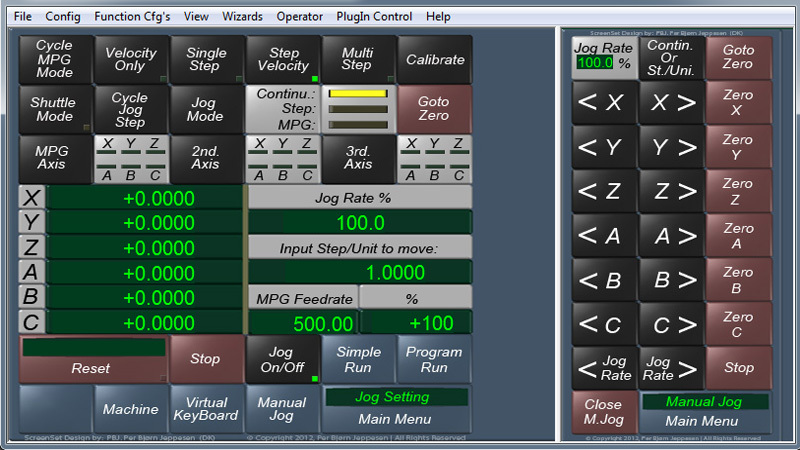 In this screenset's Manual Jog is further developed and become much more streamlined, it is made as Flyout and can be reached from all screens with a button, you can jog all six axis and you can zero all six axis here also, this has given a lot more space on all other screens, as it is now only represented here, you can also adjust Jog Rate and Continiue / step from here, note if you want the axis to move when the button is down Continues has to be sellected . The buttons are large and can easily be operated with a finger on the touch displays. The first time you open the Manual Jog adjust how much it "flyout" to fit the screenset this can be a little tricky, you must click on the edge of the menu and drag it to the desired position then close the manual jog and open it again (sometimes it goes back to old position) then just repeat the procedure again then it always "fly" the same distance out and you dont have to do this again. With the many different screenset size, there are many possibilities and combinations, eg. you can also choose a smaller screenset size and then have manual jog open all the time, like above example You can also choose a more higher and narrower screenset as below or as the secund above let i fly over the set meny of the screens is designet so it just cover a special area of the screenset. When using touch displays it is easier to start your profile directly and not through MACH3 loader list. 1) Go to Mach3 main folder and right click Mach3.exe and chose Create Shortcut. 2) Find the shortcut you just created and move it to your desktop. and click rename, copy the text and pres Escape dont rename the folder. Note yourprofile is what ever you just copy note p has to be in this position. Now you have a nice finger size icon direct to your profile. There is for this ScreenSet developed a special CNC Virtual Keyboard This is a separate application that can be accessed from all screens it will open on top in the same way as manual jog as flyout. To use it just select the desired DRO and enter the numbers on the keyboard and press Enter. It can be opened in three stages, first a number keyboard for DRO's and if you then press LETTERS button, then the keyboard will be expanded with letters for G codes that can be used on MDI Screen. Finally, you can also press the Calculator and here you get a simple calculator. A Run Screen can not be more simple than this and yet there was room for Touch Screen Navigation and the most used link from this page, and 3 toggles buttons for three outputs. 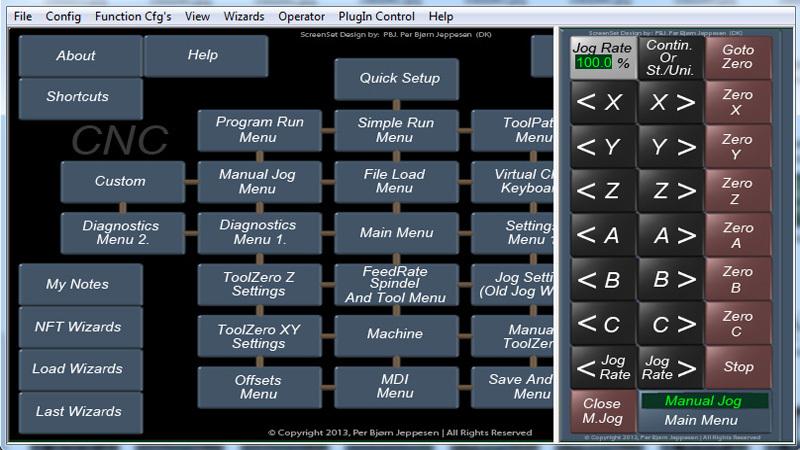 ManualJog and Virtual Keyboard can of course open top of this screen so you do not need to go to other screens to use these features. There is also made ​​room for the new function (Stop to be continued) and a large toolpath display. 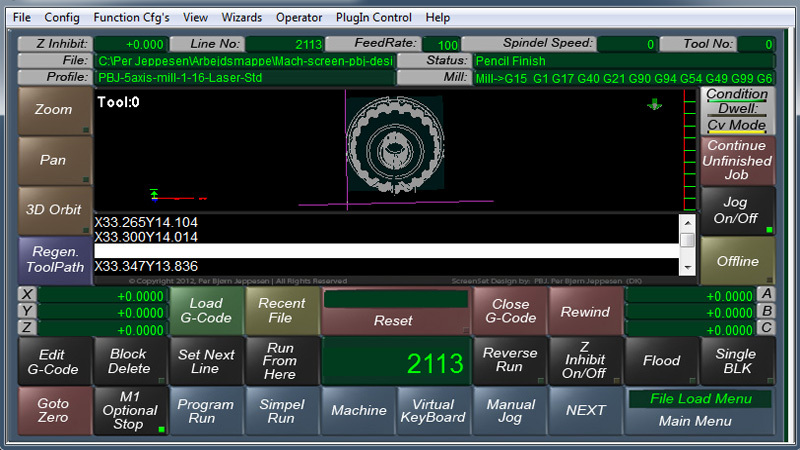 G codes are not shown on this screen as it is only for settlement of a finished part program but you can still see how far the part code has been reached on a slide bar on the right side. 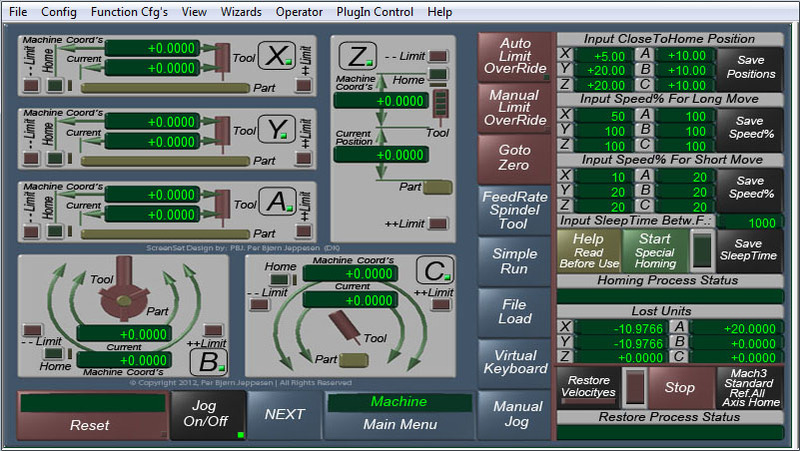 On ProgramRun, SimpleRun and ToolPath Screens there are three toggle buttons so you can activate output 4.5 and 6 if you need to manually activate pumps, spindle or another before starting program execution. There are also 3 input led. See Chapter: Stop To Be Continued. 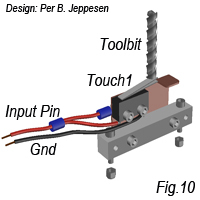 There is created a special navigation toolbar for touch displays which makes it possible to operate the toolpath display with a finger if pan is enabled (see the small part on the button itself) so that the drawing can be moved around with your finger and if zoom is enabled, you can zoom in move your finger up and down on the display can finally turn drawing three-dimensional around with your finger when 3D Orbit is enabled. This navigation bar is on all screens with ToolPath display. Stop: Can be found on SimpleRun Screen And ProgramRun Screen. Continue: Can be found on File Load Screen. "Stop To Be Continued" and "Continue Unfinished Job" is a feature many have asked for special people who run very long g-codes ex reliefs where a machine run many hours. Basically, you can at any time in the middle of a job press "Stop To Be Continued" and the function stores all six axis positions and store line number, and your file name, you can then turn off the PC and machine, and eg. next day start the machine and PC and press "Continue Unfinished Job" the function then automatically load drawing and all six axis dro positions and line number and then just pres the cycle start and the job continues from the same position as it was stopped. In fact, the function stores the current line number minus 1 this means that it starts over at the line number it was stopped in, in order not to leave any trace. Basically, you do not need the data as the program itself retrieves the data but if something happens unexpectedly, the data is stored here. Positions of all six axis. 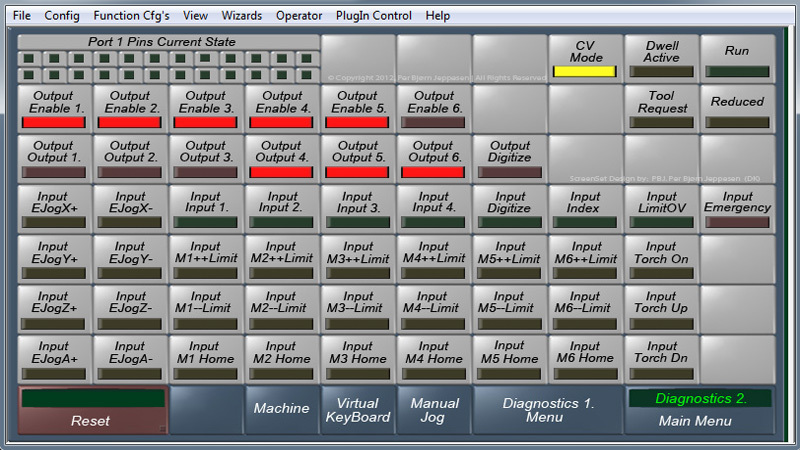 Machine Screen has information graphically shown, this Screen is good to prepare for a Job, or to test the Limit, Homing switches and relations between Machine Coord´s and Current distances simultaneously for all six axis. The small sentence after the axis letter is a Led shows if the axis is enabled, Green on Red off. On each axis, there are two displays one shows Current distance eg from part zero to center spindle and the other machine coord's from home switch to the center spindle. There are two Red Led showing Limit Switch one at each end and there is a Green Homing Led. Between the Part and Homing Led is a narrow yellow Led that shows CloseToHome position. On this Screen of the machine is also placed an Auto Limit Override button and a Manual Limit Override button so you do not need to go to Setting Screen to reset. If you hit a Limit Switch and if you have a input on each Switch this let you immediately see what limit switch is hit. Special Homing can be found on the Machine Menu below Manual Jog FlyOut. When you go to the machine menu the Manual Jog Fly Out automatically after 2 seconds, then just press close M, Jog and below is Special Homing. This feature can easily be changed in the Code, if you do not want this. This system has been modified on 02.07.2015 from using Velocities to using FeedRate. Special Homing is a	homing system that allows you to influence the individual functions in the homing process. The machine can run quickly to a virtual point CloseToHome and then slowly to the homing switch, and therefore can be used	more often than you might normally do. The system is especially good if you have a long distance to home Switches, example many have to Z home switch. Mach3 standard homing is slow and therefore not something you use often, but with this homing system, the machine can move long distances at high speed and only the accurate part slowly. After the homing it returns automatically to where it started and it has corrected the deviation and the deviation can be seen in LOST UNITS display. 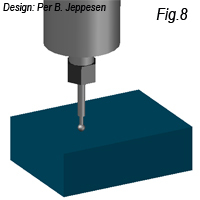 The system can be configured and used from the menu on the machine screen or the corresponding macro can be inserted into the end of the code to	a milling job to be series produced, there will then be performed a quick homing between each component and you can then from Lost Units "Kep And Eye" if the machine keeps the tolerances. The system is particularly suited to machines which use stepper motors. You can also just use the module to control your machine using the Lost Units. The system works by comparing homing result you just created with the previous homing result. There is a Status Bar that shows every	step of the homing process while it is executed, you can enter a SleepTime, a SleepTime is a	break between each function this is also displayed in the Status Bar, this is useful for troubleshooting and for "small test" set SleepTime to 3000, which is 3 seconds so that it is easier to follow, or 100 in normal operation. The system requires the installation of homing switches on the machine. If you think the machine is very out of focus, please first use MACH3 standard homing by default has a rate of 20%. Subsequently make a few Special Homings if you want to read Lost Units. Mach3 standard homing only homing ZYXA Spec.Homing is Homing all axis. An example of what can make the machine is very out of focus is if you have run with MACH3 in offline and then go online then axis can be very different from reality. Homing sequence is ZYXABC but you can easily swap the individual axis blocks in the macro. Changes in the new macro made on 02.07.2015. Use FeedRate and not Velocyties. Note: If X and Y in the long move input speed has equal value both X and Y move at the same time, and if they have different values it move independently Y and then X. 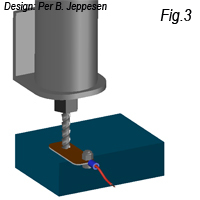 Accuracy of the Lost Units is highly dependent on the quality of the homing switch on the machine, if there are large differences may be because the quality of the Homing Switch is low, but this does	not necessarily mean that the machine is not accurate, so your machine can still make precise components. You should also be aware that if you make a homing just after you have started a cold machine, there will be a difference from when the machine has reached operating temperature, this is also relevant for even small routers. If you are using only Lost Unit for reading accuracy or differences, make 2-3 homings in a row, to make sure that the conditions are the same. In the first section "Input CloseToHome Position", enter CloseToHome position for the desired axis and press enter. Example 20mm before the home switch. (1 to 100) can be used. In the next section, enter "Input Speed​​% for long Move" This is the speed from current position to the position CloseToHome. (start with a low speed eg 20% which is the standard speed for MACH3 standard homing, to test the system) remember press enter after entering values. (1 to 290) can be used. In the next section, enter "Input Speed​​% for short Move" which is the speed from CloseToHome position to Homing Switch (Use the best low speed% for your machine 20% is standard for MACH3) remember press enter after entering values. Start with 1. (1 to 290) can be used. In the next line (Input sleep time between functions) which is a break between functions 1000 = 1 Second. The fastest it can be set to is 100 milliseconds. by setting it to eg 3000 there goes 3 seconds between each action. Remember press enter and save after entering values. Then there is a button (Help Read before use) Here you can see a user's guide. Then a button (Start Spec. Homing) to start the homing process and a large led which shows that the homing is running. And below is a small display for each of the six axis "Lost Units" where you can read Lost Units. Below is a button "Restore Velocityes" with a led and next to a large led and a Stop button. If you have to press stop in the middle of homing process, Reset will be activated and these two led will flash. This system change the speed by feedrate, so you must then press Reset and press Restore, the system is then set back to normal. Finally, there is a button "Mach3 Standard Reference all home axis" which is the standard homing button. Below these buttons is a display "Restore Process Status" that displays status. This system has been modified on 02.07.2015 from using Velocities to using FeedRate. Code is designed as simple as possible in modules and I have as far as possible tried to keep it in "if then"	commands as many people understand. By default it run the axis individually in this order ZYXABC. 1) Setting sleep time between functions from user input and check that Sleeptime is >100 and if not correct it. 2) Getting Units Inch/mm And make sure that CloseToHome distance is min. 5 mm Or 0.2 inch and max.100mm (4inch). 3) Checking If the machine is very out of focus, the homing process will stop and come up with a text message. 4) Getting position CloseToHome from user Input. 5) Getting and saving current Feedrate. 6) Checking that enabled Axis have a Feedrate Value. 7) Checking that User have input a Speed % for long Move. 8) Checking that User have input a Speed % for short slow Move. 9) Getting position from where Homing will begin and will end. 10) Getting %Speed from user input. 13) Moving to position CloseToHome. Position from user input and speed from	user input. 14) If it hit switch before closehome send and error, and Restore Feedrate. 15) Getting %Speed from user input. 18) Moving to Homing Switch is activated Speed from user input. Note: Z is Moving in plus direction and X,Y,A,B,C is Moving in minus direction. (Easy to change in the Code). 20) reverses the plus and minus. 21) Resetting Encoders and Machine axis XYZABC. 22) Moving back to the place we started the homing. 23) Setting the Feedrate as it was before the homing proces. The code is easy to change, it is made as simple as possible and does not require special software to change, you can just use the standard VB Script Editor in Mach3. Goto OPERATOR > VB SCRIPT EDITOR. And when the editor is open goto FILE. And browse to MACH3 > MACROS Folder. And open the folder for the profile you are using. Open then M2020.m1s this is the homing macro. 1) If you want it to search for home switch in the other direction (minus or plus). 2) If you want to change axis homing sequence. Save And Go is really just a memory function to store a total of 8 positions of the six axis there are four who remember the current position and four who	remembers machine positions, they are called positions 1 to 8 simply pressing on eg save position 1, then all six axis current position is saved in the dro´s and if you want to go to the saved position, press Goto position 1. On the right side of the screen there is opportunity to reset each position. In the bottom of the screen you can see Current and Machine	positions as they currently are. This screen is good for Maintenance of the machine eg if you wants to remember and go to different locations where the machine must be serviced or in all situations where you need to remember a position but do not want to zero Current position or Machine coord's. It is important to remember if you save current position and will later return to this position, but in the meantime has been reset current position from another screen you do not get to the desired position in this case, use position 5-8 this is machine coords and do not change. 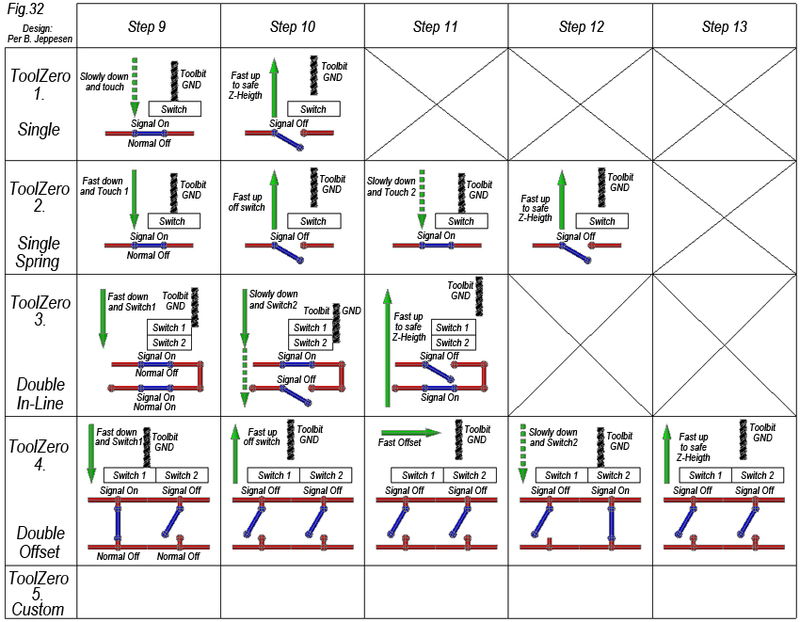 In Mach3 Standard ScreenSet both Jog setting and manual jog, is on flyout (page50). At this ScreenSet it is divided so flyout contains only Manual Jog with the most important features to jog all six axis from ALL Screens. 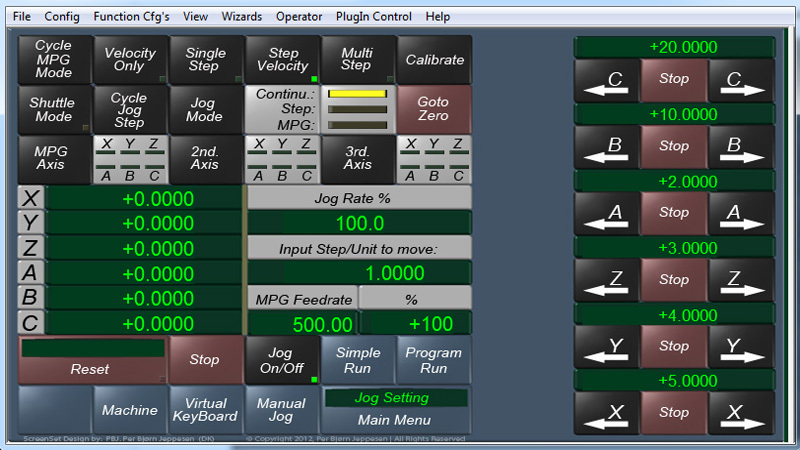 And this screen Jog Setting Menu contains the more detailed setting for jog and jog wheel, features are the same as standard screen but adapted to the new design. But in the right side of the menu there is created something new, it's a panel where you in every axis can enter a value you want axis to move, then when you press the direction (button with arrow) moves the axis to this number unit, without resetting the current. So here you have many opportunities to control the axis, the photo above you can run the axis a desired number of units and the photo below (when you press the manual jog) is flyout where you can move axis "live" when the button is down the axis is moving. These ToolZero systems are meant mostly for machines without an expensive fully automatic robotic toolchange carousel system, but when you change toolbit in the same spindle motor. For sake of good order, I would just ensure that everyone knows the difference between machine coords and current. Machine coords is a complete coordinate	system for xyzabc where 0 is defined by homingswitche these coordinates are fixed as they relate only to the machine and everything has a relationship with the machine. Current can be reset when you want, it is a second set of coordinates for xyzabc and is the current coordinates for the job you execute. So there are two coordinate	systems, and this offers endless possibilities when using them in relation to each other. If you use this system properly and have some good homingswitche you do not have much else to have total control over the machine. For Toolzero I have made four systems on three screens, to ensure that we always know where the cutting part of the tool is in relation to a part or material. For all four Toolzero system there is not required any investment to get it up and running. Two very simple systems that you can either use manually or semi-automatically where you can use a probe or just a copper plate coupled to an input, you can use this for all six axis xyzabc. 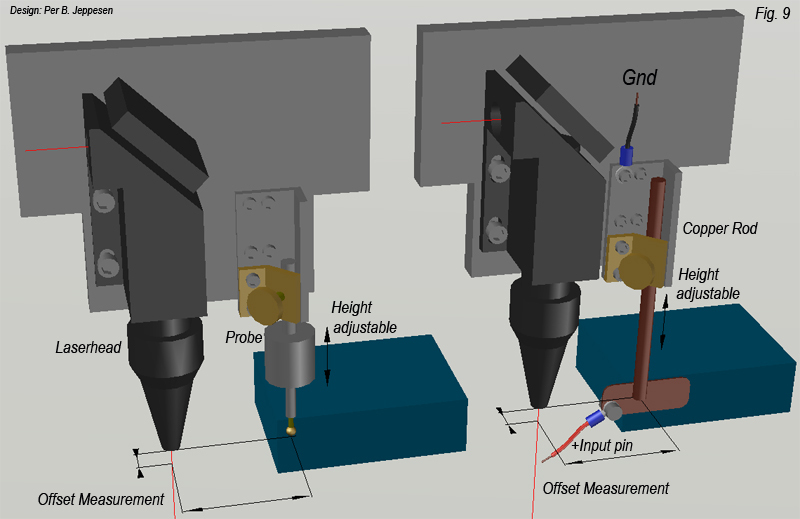 The third system is only for x and y axis, this makes a centering of tool above a fixture lying against Part or material in X and Y direction, it is a simple system which is automatic, it requiring no probe or other extra, it requires however that there is Homing Switches installed. The fourth system is a fully automated system for toolchange and toolzero of Z. This system is designed for a permanently installed switch set, NO need of probes or switches on top of Part or material. Important Note: In the following there are design suggestions and drawings with ideas, if you want to build a toolzero Switch system yourself and save a lot of money. I can not give any	guarantees for any human injury or mechanical or electrical damage caused by this guide and it is therefore at your own risk. If you want guarantees you must purchase a commercial switch and hire a professional electrician to wire it all up. Remember safety first, better late than never, wear eye protection, hearing protection extreme caution with power and make small test in slow speed and be within an emergency stop range. 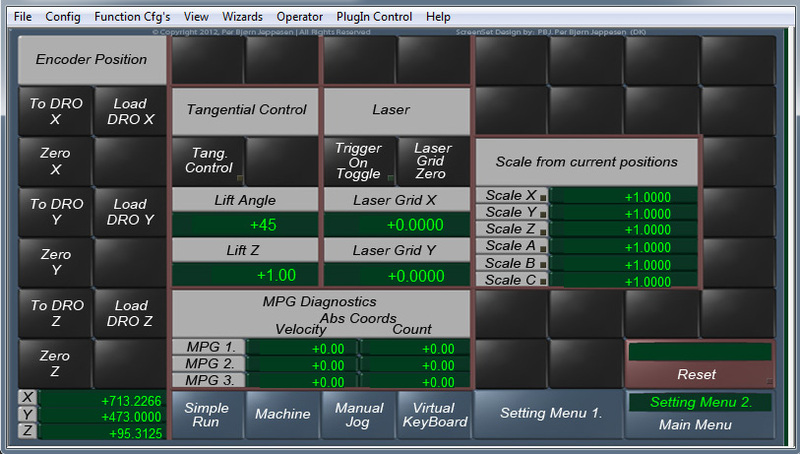 This is the screen or interface for Manual and Semiautomatic Toolzero. Note any use of toolzero without limit switch is dependent on the reaction time and speed before fatal damage. 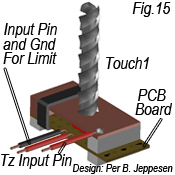 Manual or Semi Automatic Toolzero is a way to make toolzero directly at a part or component. Manual or semi-automatic toolzero can be performed with different physical systems that I have made some design proposals for, note it is only to give an idea of how it can easily be made without to cost a fortune. 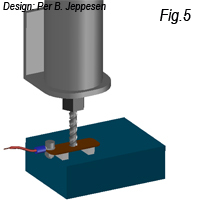 The system can be used on both Mill, Laser, Plasma. System 1) With a cobber plate which is connected to a + input pin and gnd is spindle motor toolbit, when these two poles touching each other is gives an input signal. You can also just connect it to a homing switch. Then you go into the Config> Port and Pins> Input Signals and enable Probe and make it active low and put the port number normaly 1 if only one lpt port and put the pin number you use for it. 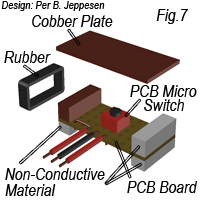 This is an almost free solution requires only a cobber plate and some wire. See drawings. System 2) You can also use a probe but it means that you must first put it in the spindle and then make toolzero and then again put toolbit in. System 3) You can also make ToolZero on a Laser or Plasma Machine, here I have designed a proposal for how to do it. You can attach a 90-degree angle section offset from the plasma or laser head , and a small plate mounted 45 degrees with a threaded hole and a knurled nut, Then you can "slide" pin or probe down below plasma or laser head when making toolZero. The reason for a 90 degrees angle is that then you are sure that it is always is accurate. See drawing. Here you can choose axis and the direction you want to make toolzero in. Display in the center are respectively Current axis and Machine coords axis. (2) Slow Feed Rate Speed​​% Here you must enter a value between 1 and 100, which is the slow speed it has when it hits copper plate or probe pin here is recommended a very low speed. (30) Plate Thickness, only enter a value if you use copper plate system. Here you enter the thickness of the copper plate, if you use the probe it has to be 0. (6) Toolbit or Probe or Pin Diameter Here you must enter Toolbit diameter if you use (toolbit against copper plate) or you must enter the probe head diameter if you use the probe, or you must enter Pin diameter if you use (Pin on copper plate) If using laser or plasma enter the beam diameter. (11) + (5) + (32) + (33) Are offset values ​​that can be used in different ways in relation to each other as the program offset the current axis. (11) Special Mill Offset: This can not be used with some of the others, if you put a value in both (5) and (32) or (33) you will get a message that you can not use this with the other. 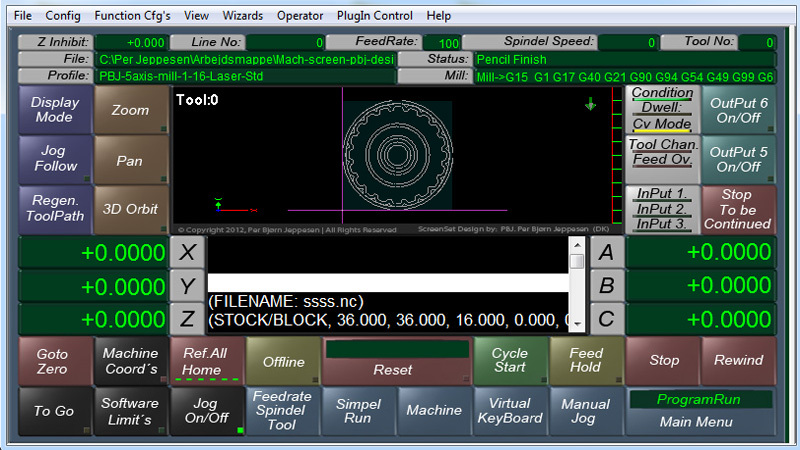 If you enter a value in (11) Special Mill Offset, all other user input will be ignored both diameter, plate ticknes and program, inserts only this value into the current axis entered in the Special Mill Offset. This should only be used if you have a very special offset you want to use and then you have to takes into account all diameters and thicknesses, etc. If you choose this way then the small display (5) will show SPECIAL. (5) Here you can choose either Center or Edge, in the small display will appear either CENTER or EDGE or SPECIAL. 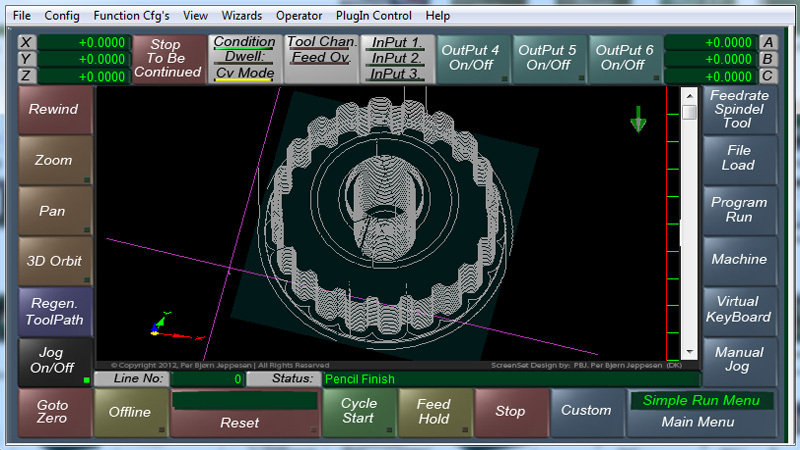 Centre will mean that the program or routine will set current axis to be 0 center toolbit above edge of the part. Edge will mean that routine will put current axis to 0 edge of toolbit will be outside edge of the part. (32) and (33) is for Laser and Plasma, if Pin or probe is offset from the cutting part, then the tool can not be used for metering, So here you can enter values ​​for this offset. First, the system works by, you move toolbit or pin or probe close to the surface you want to make toolzero up against, and then choose one of two functions Semi Automatic or Manual. 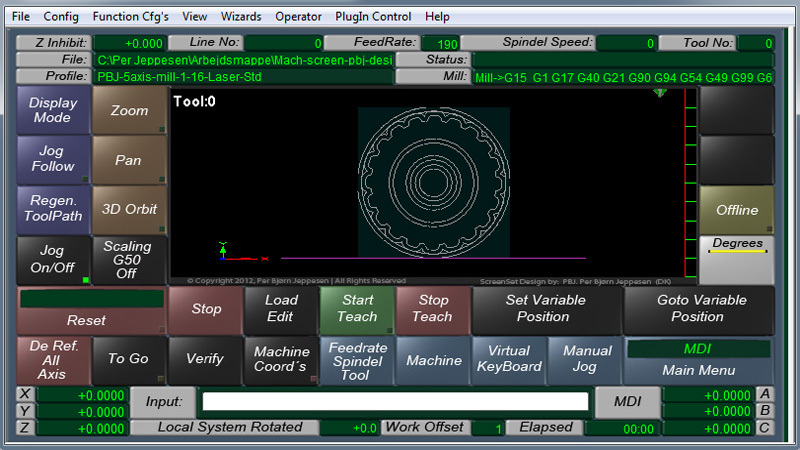 Manual: Works so that when you press one of the axis with the desired direction the machine will start immediately and move toward the surface and stops when it receives an input signal, and the program then calculates the offset from the values ​​you have entered and then set current axis to the offset value (if you want toolbit to be current 0, press goto zero for the desired axis) Note: Remember to move z above the part before tuo use zero all axis. When you press a axis direction button turns a small led on this button on and led display for manual turn on the green MOVE Led then when it receives a signal it stops moving and the green LED turns off and the red turns on and the status display show that toolzero is completed for this axis. When you press one of the axis with the desired direction the machine dont move but you can see which axis you have chosen and which direction as the red led on the button turns on, and on semiautomatic led panel turns on the green Ready led that indicate it is ready, when it gets the first of the two signals then the yellow MOVE led turns on which indicate machine is moving and when it receives signals 2 turns on the red STOP led which indicate that machine is stopped and that it has received touch signal 2. and the program then calculates the offset from the values ​​you have entered and then set current axis to the offset value (if you want toolbit to be current 0, press goto zero for the desired axis). Note: Remember to move z above the part before tuo use zero all axis. (13) Sleeptime There is a Status Bar that shows every step in the ToolZero process while it is executed, you can enter a SleepTime, a SleepTime is a break between each function this is also displayed in the Status Bar, this is useful for troubleshooting and for "small test" set SleepTime to 3000, which is 3 seconds so that it is easier to follow, or 100 in normal operation. This is the status display. This large led turns on when received a signal and off when there is no signal. With this you can live test the signal before you make a toolzero. Press Reset ToolZero after you have entered values​​, as it is not all led and text there is updated after entering. They are updated automatically when one of the axis buttons are activated. By pressing the help button you get this guide up (not a link to this page) but a separate file there match screen. The system works by calculating the current zero depending on the values ​​you have entered, and whether it should be center of the bit or edge, also the diameter of the toolbit and take into account the plate thickness. When you have touch signal there will be a value in current of the selected axis, which means when you press zero axis, the machine move to 0 and bit is where it should be. Example: Bit diameter ø4, center selected, your copperplate is 1mm Then the program will set the current to (4/2) +1 = 3mm then when you press the zero axis, machine will move to current 0 and center of toolbit will be above edge of Part . If you had chosen Edge, edge of toolbit would be the edge of the part. If you had set values ​​in x and y for laser and plasma, the program would then add this values, ​​so the result would be the same regardless of where the pin / probe is relative to the beam. Remenber: Gnd on the lpt port is also gnd on the chassis of your PC so the chassis of your PC must be connected to gnd on your machine. Here you see the manual jog flyout activated so you have all the features available. Note: Manual ToolZero can also be used to calibrate the XY Fixture / land described later. This is a fully-automatic system for the control of the Z-axis. It is meant as a permanent installation on the machine just like limit and homing switch. It is intended for machines where you change the toolbit in the spindle. 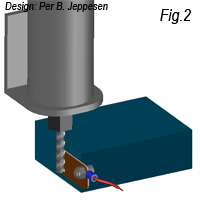 On a machine, you normally have a limit	switch and a homing switch for X, Y and Z axis, but with the Z	axis Limit and Homing switch is actually at the wrong end, so you know just what height spindle is in, but in reality it is the ToolBit tip you want to get "homed" or want to know the height of. 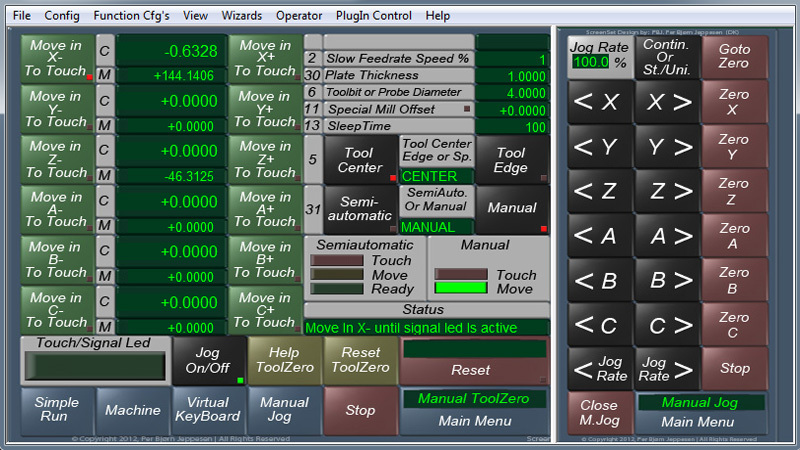 Toolbit have different lengths and when you change the toolbit, the program can no longer know what height the toolbit is in. Typically, you change toolbit in middle of a job, and if you do not have a ToolZero Switch or Toolreset Switch, (it will be called several things) you know the challenge it is to ensure that toolbit tip is in same height when you have changed Toolbit in the spindle and need to continue the job with the new bit. 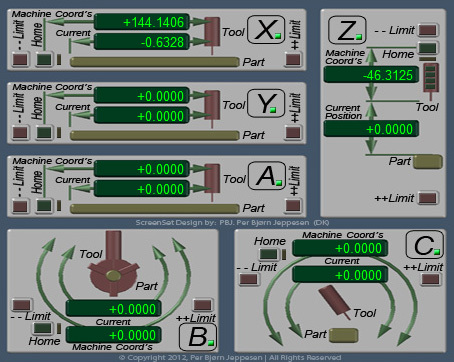 With this screenset and after making a switch, you will have a fully automatic ToolZero system for toolbit tip with both a kind of homing and limit for z in the right end of Z-axis. Using several toolbits is now a pleasure, and you do not have to think "it's easier to do it all with the same small toolbit" with consequences that the job then take years. I have chosen to make a	slightly larger chapter on this phenomenon as there are many who do not have a toolzero system and because there is not really a	good system for smaller machines as both are fast, safe, accurate and easy. And because it is one of the best investment of time on the	machine, the time spent on Implement the system, you will get back many times. Therefore, I have also designed some very simple switching systems that are both easy to make and cheap but still accurate If you already have a switch you will be able to use it on this ScreenSet with more options. The system requires only a few settings and a switch then toolchange and toolzero will be a pleasure and you will not "consider whether or not it is easier to do it all with the same toolbit and save the hassle" which in turn means that it takes a very long time to make the component or project. 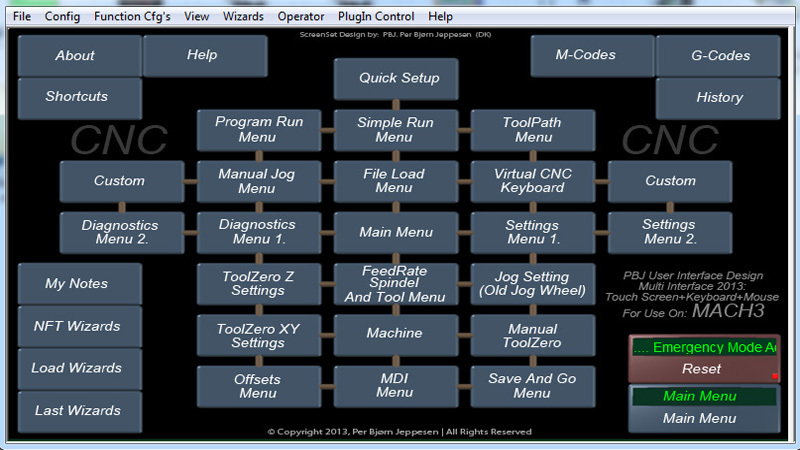 This system consists of two parts ToolChange and ToolZero. The first part is ToolChange, the machine simply go to the location on the machine where it is easiest to replace Toolbit. The second part driving the machine to a toolzero switch and assessing toolbit tip height a bit like a homing, it calculates the new z height and then run the machine back to the exact same place it came from and is ready to proceed the job with the new toolbit. The principle is probably best explained with a simple example: you have a job / part that requires 2 toolbit a 6mm and 2mm, and this change must occur in the middle of the program. In Cam program you can as you probably know define multiple tools and sizes. After the program is finished with 6mm toolbit Mach3 stop and ask for ToolChange: then it requires only that you press StartToolChange button, the machine run simply to the location you have defined as ToolChange location the place it is easiest to switching toolbit, then you change the toolbit to the 2mm toolbit, and press StartToolChange again, the system finds out to ensure that toolbit tip is in the same height as it was before ToolChange, spindle automatically returns to the same position as it was before ToolChange and is ready to continue, then pres cyclestart and the machine is started again without you have to worry about anything. Of course you can have as many tool change	as you like. If you have not tried such a toolzero before you will not understand that you have been able to live without once you have tried it. There are 4 different Toolzero methods on this ScreenSet so whatever toolzero switch you have or will create you will be able to use on this ScreenSet, if you do not have a toolzero switch's there are drawings and ideas for many solutions, so whatever tools you have available, you will easily be able to make one. As written, I have chosen to go very depth with this system and have found it necessary to divideit into 4 sub chapters. Enable Probe and select port 1 if you only have one lptport and the PIN Number must be the input pin your toolzero switch is connected to. and then Enable active low. So it is important to note that toolzero, touch or switch works only if input digitize led is turned on, on the diagnostic page when touch or switch is activated for toolzero. Important Note: The following are only suggestions and ideas if you want to build a toolzero system yourself and save a lot of money. I can not give any guarantees for any human injury or mechanical or electrical damage caused by this guide and it is therefore at your own risk. If you want guarantees you must purchase a commercial switch and hire a professional electrician to wire it all up. Remember safety first, better late than never, wear eye protection, hearing protection extreme caution with power and make small test in slow speed and be within an emergency stop range. 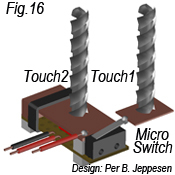 Important to note before start making a switch system with touch, is that it only works with conductive toolbit as cutting and milling toolbit but ex diamond grinding toolbit does not work and you have to if that's what you use most often choose a system exclusively with switches. For large commercial cnc machines, there are toolzero switches but they cost more than a good milling / router machine. There are also some small finished switches for hobby machines you can buy online but I have not been able to find anyone have a limit function built-in. I will describe some different switching systems I've designed as either free to use or be inspired by for your own machines. There will be described advantages and disadvantages of the different systems. 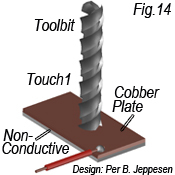 I believe that the best system available is Touch system toolbit is GND and the other part is typically a copper plate to create a contact between these two. 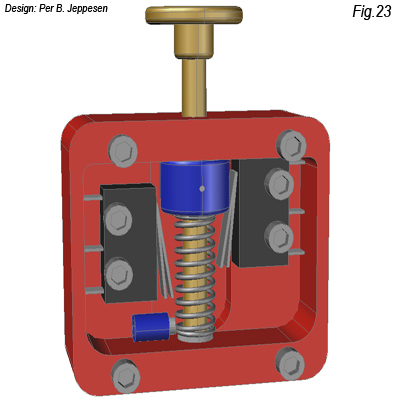 But there are two missing elements in this solution a limit switch and a system so toolzero can be performed quickly, if you are using a copper plate Z run very slowly to just touch the plate and if it is a fixed integrated system or fully automatic, it will typically be from safe Z height and therefore take forever. A limit switch system for toolzero is in fact just as important as the other limit systems that are firmly integrated in the machine, especially with the touch as if there is a signal failure toolbit will be destroyed or, at worst, other vital parts. So I would recommend to all solutions also have a mechanical limit switch, this switch does not require any software terms it stops everything if it is activated as emergency stop. On toolzero Screen, you can choose 4 methods for toolzero, I will write which one to use on each switching system. I'll start with this system as it explain the different steps I think are important from the very simple to the more sophisticated. As mentioned before, Limit system on a machine stops all if it is activated just as the emergency stop. Homing or toolzero switch do nothing unless you in a script has asked it to respond to a signal from such a switch, so it is in fact this we use for toolzero, Limit is just behind as safety and stop everything if it is activated. This system is build around a PCB circuit board with a PCB micro switch serving as Limit switch still touch as toolzero on an overhead copper plate. 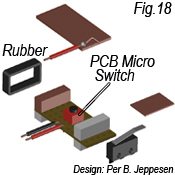 PCB switch must touch the copperplate so that it is as little as possible copper plate must be pressed before the limit switch is activated. (so the plate is not deformed or spring back effect is lost). In this system, there are 3 wires 2 for limit switch. So this solution is both precise and have safety with the limit switch but is still a slow process, as there is no possibility of overrun. What I mean by overrun is that in order to make a quick toolzero, this will mean that toolbit will hit the switch at high speed and depending on the machine type, this could make it run a little too far. For this system, use the method ToolZero 1 (single). 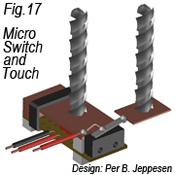 Now if we want to make it fast, we need to have some gap or space for overrun and here we could add a small switch (traditional limit switch) that is bendable and flexible and allows some overrun, but we want to keep the high accuracy that is in the touchplate so we could divide it into two systems. So here the toolbit run at high speed to the switch and get a signal then reverses off the switch and move slowly to our touchplate and get an accurate measurement. Hereby the slow and accurate speed is minimized to happen over a short distance. For this system, use the method ToolZero 4 (Double, Offset) safety is still limit switch under the copperplate and flexible switch is mechanically. The last drawing of this system is a "exploded" drawing of the switching system. This system was the first I used, it is easy to make. You can drive fast but there are not any limit switch in this system. Toolbit run quickly to flexible switch is activated (touch1), moves back off the switch and making a offset to the copperplate. Toolbit then move slowly to the copper plate and get signal (Touch2). 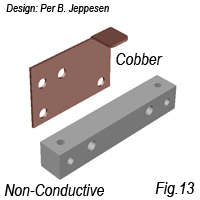 This shows that both the switch and the copper plate is to be connected to the same input and switch must have a separate GND and the toolbit is GND for the copper plate (touch). For this system, use the method ToolZero 4 (Double, Offset) However, I would not recommend this system as there is no limit switch built, I show it only because you often can get some ideas by looking different systems. 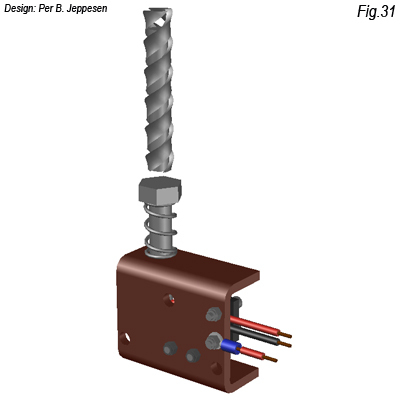 Here is a more artistic design of the system shown in Fig:17 this solution also has all the features it is fast, it can make an accurate measurement and has built-in safety. Total 4 signal points but it requires only 1 input as the two touchplates are connected and all the mechanical switches are limit switch and connected and simply connected to the existing limit system. 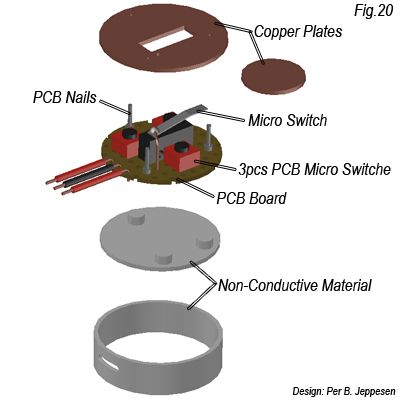 Showing component "exploded", here you can see that it is built around a PCB circuit board and the large copperplate rests directly on the three PCB micro switches, and the plate is guided by three PCB nails. This is a solution that is more hard to do and it requires a lot of attention to make it accurate. There are many places online you can buy a small fiber optic switch which in principle is just a relay which is activated by there is light through from one fiber cable to the other. There are also a lot of setting options to set how accurate and how they measure. These optic switching systems can be purchased online from $ 50 and up. 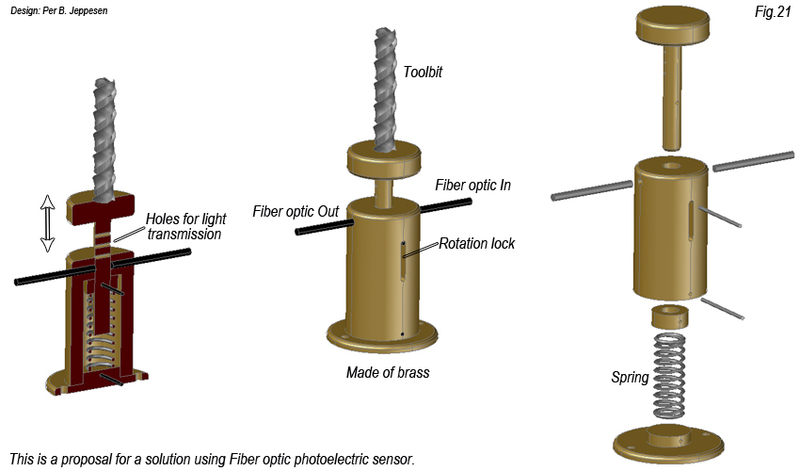 For a fiber optic system, I have designed this solution which is made of brass, which is also a conducting material and Act as well as copper. well copper is admittedly more conducting then brass but it is such a small difference that it has no practical significance. As can be seen in cross-section, there are three holes in the brass axis, each of which gives a signal when the light pass through or between fiber wire. This system can be used in tre ways. In order to make the component it requires a lathe, but the component is simple and can be made in many sizes and shapes but as I said, you have to buy a fiber optic switch. It also requires that this switch need between 12 and 24 volts and then the switch (However, depending on the type) providing a current when activated this may require a second relay, it is a simple mechanical solution but more demanding electrical. And especially since it require more if the limit must be integrated. So the model I would recommend it is a safe switch system and can be hooked up to several different	solutions. 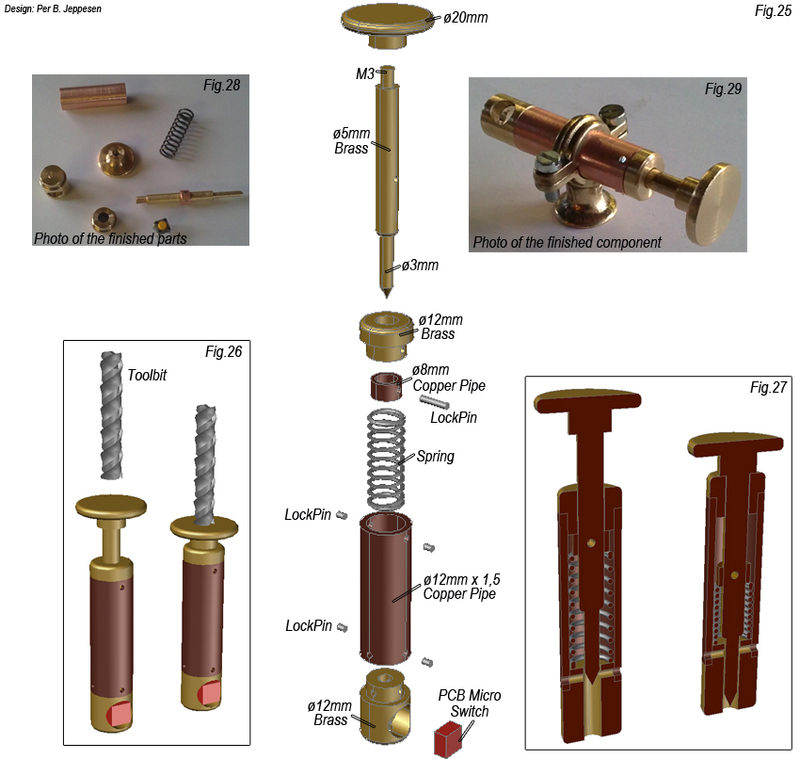 The first thing you think is probably it is a tremendously big unit, but it may in fact be made down to 25/30 mm in width and height, (plus the brass pin), the system uses the traditional small switches and they can be purchased online they are even available as small as 12mm in length and 6 mm in height. 1) If You use the touch system which means that toolbit run quickly down and touch the brassplate and receive a signal (overrun is possible because of the spring) it then moves back free of signal and then move slowly down to brassplate again for accurate reading. The first mechanical switches are limit switch and connected to the existing limit system. This solution does not need the second mechanical switch. For this system, use the method ToolZero 2 (Single, Spring). So all in all I would recommend this switch solution and I would recommend the first method as only require one switch. 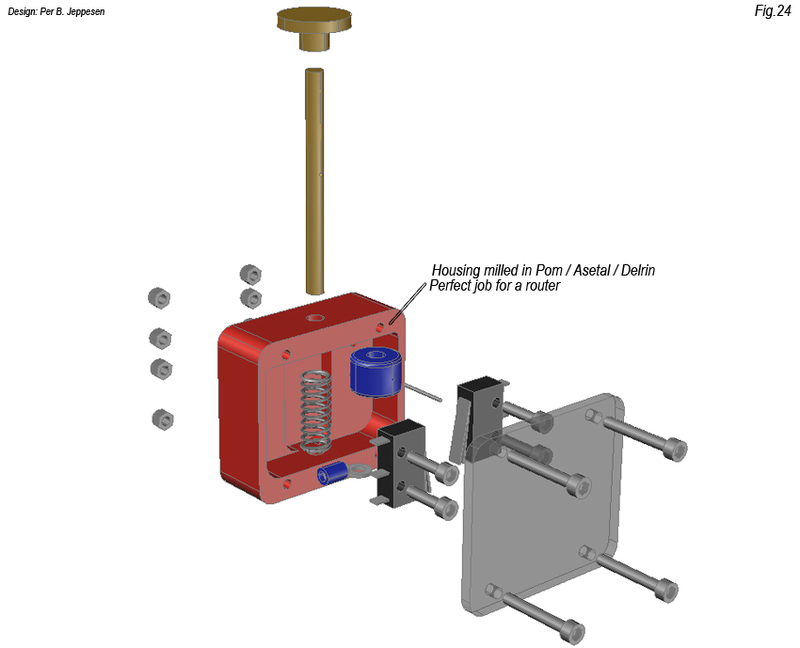 This solution is simple both mechanically and electrically and is very safe due to mechanical limit switch and can perform a very quick toolzero since overrun is possible due spring by both touch and limit, it is accurate due to touch. If you start to make the housing so there is room for both switches then you have a future-proof system so you do not need to change strategy If you suddenly want to use the machine differently. And a good tip select switches with the possibility of both normal open og normal close. This system is the system I have on one of my machines now, it was before I got the idea as shown in fig.22 and 23 so I would still recommend the solution in fig. 22 and 23, but I show it anyway which is also a good solution but it requires more to do specifically limit switch. The drawing explain very well the system, toolbit run quickly down and touch the brassplate and receive a signal (overrun is possible because of the spring) it then moves back free of signal and then move slowly down to brassplate again for accurate reading. 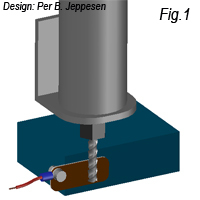 Limit is a small PCB switch hit by the narrow tip section of the shaft where there is also room for a little overrun. 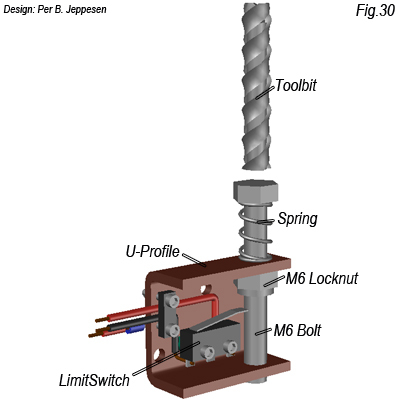 For this system, use the method ToolZero 2 (Single, Spring) In fact, this switch is made from plumbing components fitted with a lathe. This is the most simple switch system I could invent that has all the important features and yet can be made from what most people already have in their workshop or hobby room. 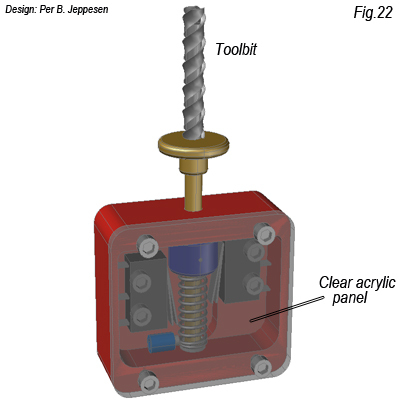 It works by toolbit quickly move down and touch the (top of the bolt) and receive a signal (overrun is possible because of the spring) it then moves back free of signal and then move slowly down to (top of the bolt) again for accurate reading. 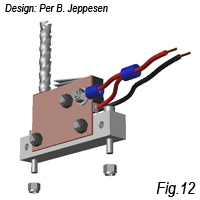 The mechanical switch is a limit switch (overrun possible due spring and switch arm). You can se how to wire it up in diagram Fig.33 or read more detaile below. Limit switch in toolzero has to be connected like your other limit switches are connected. And require no further. Limit switch should simply stop all movement when activated like the other limit switches. See Fig. 33 further down the page. Your machine has a limit system which correspond to circuit2 or 4 or 6.in Fig.33 The most commonly used is circuit 2. First we ensure that it works as it should, reset your machine so that it is ready to run, try to manually press / activate a limit switch, it should make the reset button activated and scrolling text writes emergenzy mode active. Reset your machine, and remove a wire from a limit switch without activating the switch, If reset is activated when you remove the wire the circuit you have is either circuit 2 or 6 if the reset is not enabled, your circuit 4 or 6. If it is circuit 6 it means that each limit switch have their own input / pin which usually is not the case, but it can be revealed by going to diagnostic page diagnostic 2 of this screenset. If all led is on when a limit switch is activated then circuit 6 is excluded. Then it is circuit 2 or 4 depending on the previous test. If one Led turns on for each of the limit switches is a circuit 6 and if you will follow this system, you need an input more and wire it up the same way as the other switch. Circuit 6 can be both normal open or close switch that is revealed by doing the same test as when we had to decide if it was 2.4 or 4.6. If your circuit is circuit 2 (Fig.33) Then it is shown in the diagram how to wire it up. Your limit switch for toolzero must be normally closed and in principle you can break the limit circle where you want and put your new limit switch between. Or take a wire from one existing switch and put the new in-between. If your circuit is circuit 4, you can just connect the new switch directly on an existing (parallel). There should not be made settings changes in port and pins, unless the circuit is circuit 6 and in that case you just added one input more. 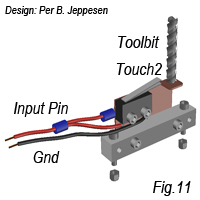 The system that creates a contact between toolbit GND and an input pin correspond to a normal open switch. ToolZero must either be connected to the homing system or have a separate pin / input depending on your machine. If your circuit for homing is circuit 3 (Fig.33) (normally closed) you must connect it to a free input pin, if your circuit is circuit 5 (normally open), you can connect it directly parallel to homing circuit. You must enable Probe and select port 1 if you only have one lpt port and pin number must be either the new input pin you connect or if you connect the touch system to your existing homing system must probe pin be the same pin number. In addition, enable the active low. It is important to note that toolzero touch or switch works only if input digitize led is turned on, on the diagnostic page when touch or switch is activated for toolzero. Your machine has a homing system which correspond to circuit 3 or 5 or 6.in Fig.33 The most commonly used is circuit 2. First we ensure that it works as it should, go to the diagnostic page, diagnostic page 2 on this screenset, try manually press / activate a homing switch, and if you use 3 axis XYZ and if a homing led turning on or off, of each homing switch's then it is circuit 6 each switch has its own input. But if all three homing led is turned on or off at the same time regardless of the homing switch you activate then your circuit is 3 or 5. In order to find out whether it is circuit 3 or 5, you must remove a wire from a homing switch without activating the switch, If all homing led switches on when you remove the wire the circuit you have is circuit 3 if only one led is turned on, it is circuit 5. If it is circuit 6 this means that each homing switch have their own input / pin and if you will follow this system, you need one more input, and wire it up in the same manner as the other switch. Circuit 6 can be both normal open or normal close this is revealed by doing the same test as when we had to find out whether it was 3 or 5. 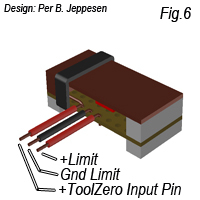 If your circuit is circuit 3 (Fig.33) you have to use an empty input pin and install a separate wire from the empty pin to your toolzero switch and set it up in port and pins. If your circuit is circuit 5, you can just connect the new switch directly parallel to an existing switch. How do i set up a new pin/input in settings and wire it up. The following is based on that you use lpt 1 port for homing and limit and therefore also to toolzero z.
Pin 10,11,12,13 and 15 is normally used for	homing, limit, emergency, and if you must use a separate input pin to toolzero you must find an available pin of Pin 10,11,12,13 and 15. And install a	wire from this pin to your	toolzero switch note it must be connected to the part which is isolated from gnd. Gnd on the lpt port is also gnd on the chassis of your PC so the chassis of your PC must be connected to gnd on your machine. So now you have a contact between toolbit and the touch part on your switch now you have to make the settings in port and pins. Go to Config > Port and Pins > Input signals Scroldown and find a input there is not in use. Enable the input, and select port 1 if you only have one lpt port, and enter the pin number you have installed the wire on. Scroldown down to probe and enable Probe and select port 1 if you only have one lpt port and enter the same pin number as before. In addition, enable the active low. If you do not get any signal check your gnd completely from your PC to the control card and your machine to your toolbit and note diamond bits are non-conductive and can not be used to touch as previously mentioned. On most Breck out boards there is a direct path from the 5 available input on the Lpt port. If you want to use a switch instead of touch, you can integrate this in homing system whether it's circuit 3 or 5 on your machine your switch should just be normal open if the circuit 5 and normal closet if circuit 3. Basic steps in the code: Note: It is only step 9-13 there is different in the four ToolZero Mode, and these 4 modes, is depending on your switch choice. You push the bottun START Toolchange/Toolzero. Step 2 Going to your safe Z height position. Step 3 Moving X to ToolChange position. Step 4 Moving Y to ToolChange position. Step 5 Moving Z to ToolChange position. After you have change the toolbit. Step 6 Going to your safe Z height. Step 7 Moving X to Switch 1 position. Step 8 Moving Y to Switch 1 position. If toolzero 1 (Single) is selected. The code do the following. Step 9 Z moves slowly down from the Safe Z to signal from the switch (toolbit activate switch or touch plate). Step 10 Z moves Fast up to Safe Z height. If toolzero 2 (Single Spring) is selected. The code do the following. Step 9 Z moves fast down from the Safe Z to signal from the switch (toolbit activate switch or touch plate). Step 10 Z moves fast up off the switch. Step 11 Z moves slowly down to signal from the switch (toolbit touch switch / plate). Step 12 Z moves Fast up to Safe Z height. If toolzero 3 (Double In-Line) is selected. The code do the following. Step 10 Z moves slowly down from switch 1 to signal from switch 2. Step 11 Z moves Fast up to Safe Z height. If toolzero 4 (Double Offset) is selected. The code do the following. Step 11 Z make a fast Offset. Step 12 Z moves slowly down to signal from switch 2. Step 13 Z moves Fast up to Safe Z height. Step 14 Moving X to Saved position. Step 15 Moving Y to Saved position. Step 16 Moving Z to new Z height but toolbit tip in the same height as before toolchange. You can also see the four toolzero modes and the various steps in the graphic chart Fig.32 Below. This is ScreenSet Screen for Tool Height Z Control Different Z-Axis Height but same ToolBit Height. Note: Small red buttons with numbers used to automatically capture the current position. Note: Before you make any settings on this screen, it would be a good idea to make a homing on the machine first. Here you select the ToolZero method you want to use, the various methods can be seen in fig.32 and in the chapter "The Code". 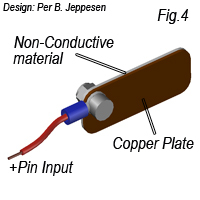 The method chosen can be seen by the small Led on the button turns Green when sellected. Here you put the speed of all movements during ToolZero, There are two speeds Fast FeedRate Speed​​% is used by all non precision demanding movements, and Slow FeedRate Speed​​% is where we make final measurement or final positions where precision is required. The speed can be set between 0-300 as on the feedrate screen. It is best to start with very low speeds when you set up the whole system, you can always optimize by increasing the speed until you have found the best rates for your specific machine. Note: Safe Z Height for ToolZero is not the same as Safe Z Height which is used in mach3 this safe Z is specially for this system. This is how you do, move your Z to the position that you think is the most secure z height regardless of the toolbit length you want to use in your spindle and based on the highest material thickness you want to use. Or if you are not sure move z to the highest position just before the limit switch. Use Manuel Jog to move the axis. When your z axis is in the desired position press the little red button on the left side, with number 3 this will copy the position to the display. Note: This system is based on that your ToolZero switch is installed as a fixed component on your machine. Now we need to tell the machine where in x and y direction the ToolZero switch is installed. 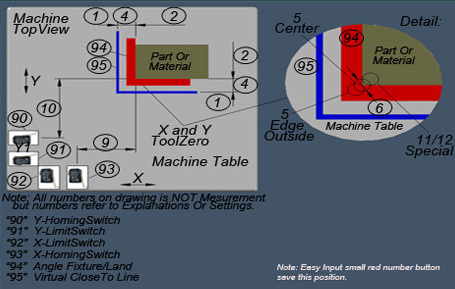 On ToolZero method 1 + 2 + 3 You only need to use (X-MachineCoord position Switch) and (Y-MachineCoord position Switch) If you use ToolZero method 4 you also need to make setting for (X-MachineCord position Sw.Offset) and (Y-MachineCord position Sw.Offset). This is how you do, move your X and Y axis with manual jog to the center of your switch an press the small red buttons to store the positions. This height difference the Code calculate automatically. There is a Status Bar that shows every step in the ToolZero process while it is executed, you can enter a SleepTime, a SleepTime is a	break between each function this is also displayed in the Status Bar, this is useful for troubleshooting and for "small test" set SleepTime to 3000, which is 3 seconds so that it is easier to follow, or 100 in normal operation. Close to distance being used in places where we do not have a switch to tell us that we need to change the speed from high to low. It is used when toolbit moves back to where the toolzero process started example in the middle of processing a component, here we do not have a switch and when it should preferably go fast, we use closeto. You must enter a distance from the final position where it needs to go from fast to slow eg. 10mm, which means it change speed 10 mm before it must stop. This is how to make the settings, move X,Y and Z to the position on the machine where you are most comfortable with changing toolbit, then press the three red buttons 11.12 and 13 to save the position. Note: Z position should preferably be high in order not to collide with future components and it is usually also here it is easiest to change toolbit. Note: If you do not want to use toolchange position, enter 0 in all three display 11.12 and 13. These displays show Current and Machine Positions. 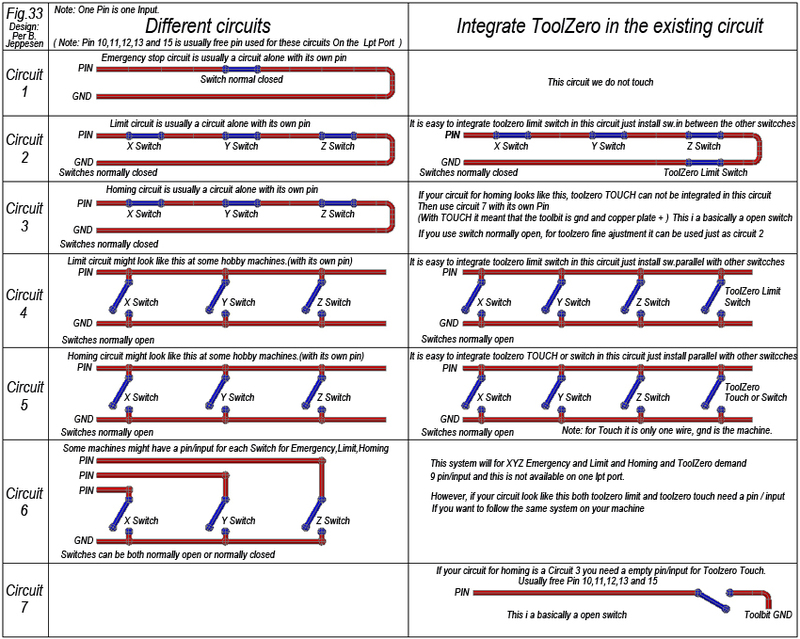 This is the status display for ToolZero Z, This display shows the various steps in the process. However, depending on what input you have made in sleeptime, If it is set to 100 as you normally use when everything is in general use, then you can not see the different step because it goes very fast but if sleeptime be higher eg. 1000 which is 1 sekundt you have time to see the different steps,and this is useful for troubleshooting and for "small test". When you press the Help button opens the entire ToolZero Z Guide in an HTML document, so you have the manual close at hand. Reset ToolZero resets the entire screen, use this If you have been forced to press stop in the middle of the process. This is actually only a memory display for the program to Ref height. 1) Before you use Toolzero first time after you have entered all settings. 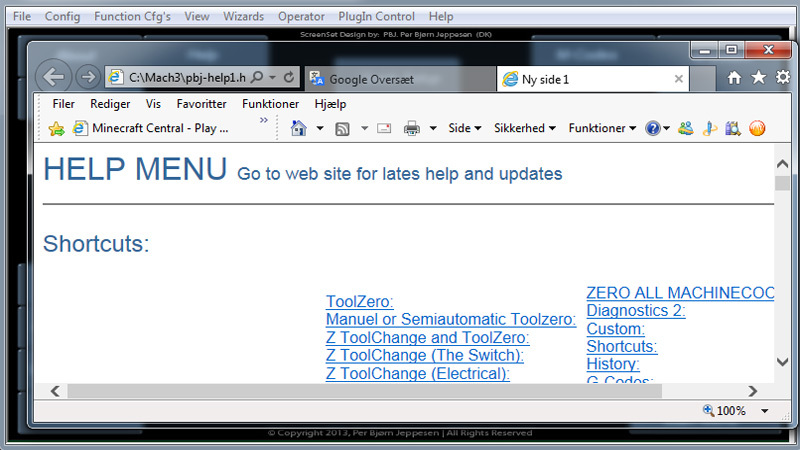 2) If you have made a toolchange without then made ​​a Toolzero. 3) It's also a good idea to run "Make Reference Height" after you have made a homing of all axis. 4) If you have moved toolzero switch in height. To understand the importance of and the difference between "Make Reference Height" and "Start Toolchange Toolzero" it will probably be most understandable to describe what macro / program does. When you make a "Make Reference Height" machine move the toolbit to toolzero switch is activated and it reads Z machinecoord and stores this value in the display "Saved Ref. Height" machine then move back where it came from. 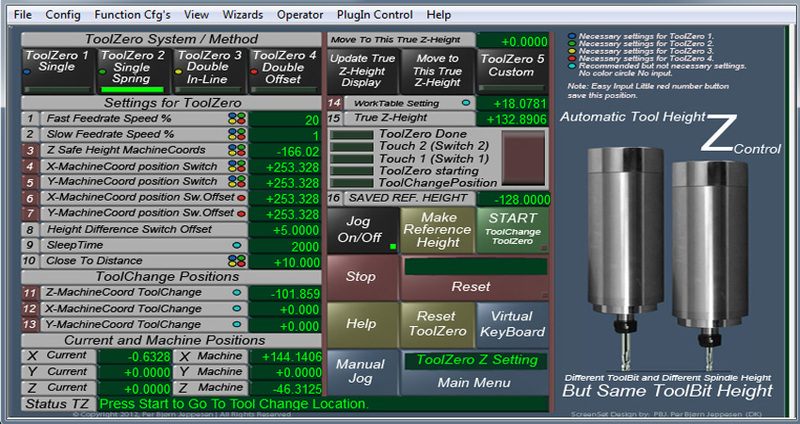 When you press "Start Toolchange Toolzero" (green button) the machine first move to toolchange location and when you have changed toolbit machine move to toolzero switch is activated then reads z machinecoord and subtracting this height from the saved ref height, thereby it have the difference, then it move back where it came from with corrected height and stops so toolbit tip is the same place as before, with the new toolbit. Then It save the new machine z height as a new ref height. Therefore, it is important to run a "Start Toolchange Toolzero" EVERY time you change toolbit, otherwise you may get a crash because the program does not have the ability to know where toolbit is. If you have changed toolbit without running a "Start Toolchange Toolzero" you have to run a "Make Reference Height" and your are back in the game. Important if you are doing some physical changes to the machine, make sure to update the settings according to these changes. Toolzero can be used even if you do not use homing switches. This led display shows both the status of ToolZero Z and shows with the big red led when ToolZero switch is activated live. When ToolChange is in progress or completed, the green led in the bottom turns on, and when ToolZero Z is started the next led is turned on and when it has received a signal from the first switch the next led is turned on and also with switch 2 and when ToolZero Z is completed led on the top is turned on. With this panel you know what height Toolbit tips is above worktable, I call it true Z height. To use this system, you need to do the following, when all other settings are made and you have run "Make Reference Height" Move the Toolbit tip to touch worktable and press the little red button with the number 14, then the settings is made for True Z height. This is not a dynamic system that constantly shows true Z you need to press "Update True Z-Height Display" button, then is displayed height above work table as a positive value. However it is updated automatically after use of "Make Reference Height" or "Start Toolchange Toolzero" and if you use move to this height. You can also eg. decide the toolbit tip should be eg. 19 mm above the worktable, then enter 19 in the display "Move to this true z-height" and press the button " Move to this true z-height" then toolbit moves with slow speed to this position. Both ToolZero 2 +3 +4 run in fast speed to switch 1 at both the "Make Reference Height" and "Start Toolchange Toolzero" as there is expected a flexible switch in this position. ToolZero 1 run is slow speed both at "Make Reference Height" and "Start Toolchange Toolzero" because we do not have a switch that can change the speed in this method and closeto we can not use, because when we have change the toolbit it is not possible to calculate a closeto. 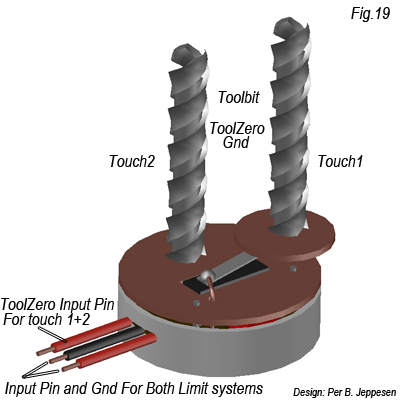 This toolzero z is based on the switching toolbit directly in the same spindle. And you run a toolzero after each tool change. 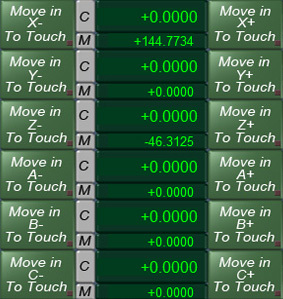 Toolzero 5 Custom is prepared to custom code and made ​​room for the code in the macro 2040 "Start Toolchange Toolzero" and in macro 2039 "Make Reference Height". If you make a custom code in these two macros, it is important that you remove some code in the macro for toolchange 2038 It is shown in the Coden what to remove. When settings are made, it is easy to use. We use only the start button at toolchange and then start button again at ToolZero. And if you have had toolchange without using the system just run a "Make Reference Height". And the time you spent on doing this you will earn a lot times back and will save you a lot of frustration. Note: It is a good idea to begin with a homing of the machine. This system is based on that you have a fixture or land you push Part or material up against so that x and y is fixed. It is also based on that Fixture or land is located somewhere else than homing switches. If you have homing switches in direct line with the fixture, it will only be offset of tool diameter there is necessary. But with this system fixture can be placed freely, you just enter the location in relation to homing switche and tool diameter and if you want toolzero to be center, edge or another. This system uses the same virtual closeto system as spec homing meaning it can be done faster than usual. The only requirement to use this Toolzero is that you have to enter some settings and options before you can use it. This is described step by step below. then toolzero is perform automatically when activated. 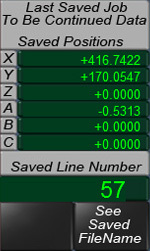 "95" Virtual CloseToLine The Blue angle line illustrate where the machine goes from Fast Speed to Slow Speed. Close to distances and Fast, Slow Speed can be Set to what is best for your machine. (1 and 2) Here you put the speed of all movements during ToolZero, There are two speeds Fast FeedRate Speed​​% is used by all non precision demanding movements, and Slow FeedRate Speed​​% is where we make final measurement or final positions where precision is required. The speed can be set between 0-300 as on the feedrate screen. It is best to start with very low speeds when you set up the whole system, you can always optimize by increasing the speed until you have found the best rates for your specific machine. (3): Note: Safe Z Height for ToolZero is not the same as Safe Z Height which is used in mach3 this safe Z is specially for this system. This is how you do, move your Z to the position that you think is the most secure z height regardless of the toolbit length you want to use in your spindle and based on the highest material thickness you want to use. Or if you are not sure move z to the highest position just before the limit switch. Use Manuel Jog to move the axis. And input this height. (4): Close To Distance/Length: It is the distance from the blue line in the drawing which is a virtual distance to the edge of the material or part where the machine goes from high inaccurate speed to slow speed accurate . The distance is the distance before finally toolzero. 5) Here you can choose either Center or Edge, in the small display will appear either CENTER or EDGE. Centre will mean that the program or routine will set current axis to be 0 center toolbit above edge of the part. Edge will mean that routine will put current axis to 0 edge of toolbit will be outside edge of the part. 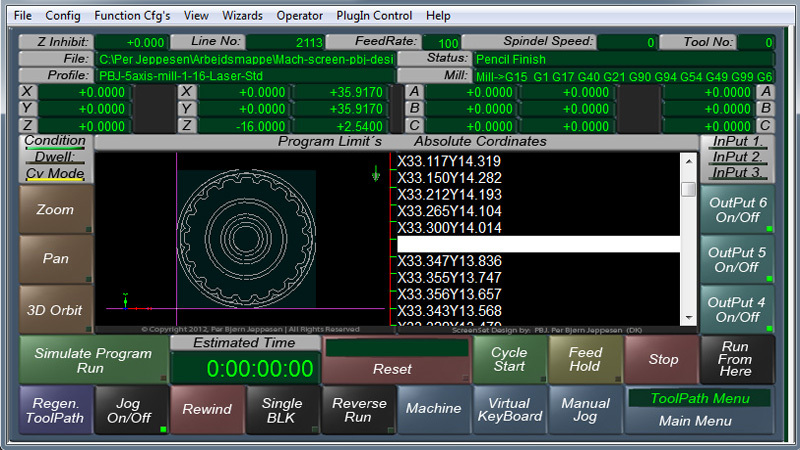 (6): Tool Diameter: Before the program can make toolzero it must know the tool diameter. (9): Part Zero X-MachineCoords: Here you must enter the distance from the homing switch turned On to the edge of the fixture which part bears against and note it must be machine coords. You will find this distance best by first home the machine with spec homing and then run manually close to the edge and then use Semi Automatic / manual homing. (10): PartZero Y-MachineCoords Same as 9 just for the Y axis. (11): Special Offset X If you want toolzero to be somewhere else than center or edge (see detailed drawing) you can here enter a + or - value so offset is relative to the fixture / part line. (12): Special Offset Y Same as 11 just for the Y axis. (13): Sleeptime you can enter a SleepTime, a SleepTime is a break between each function this is also displayed in the Status Bar, this is useful for troubleshooting and for "small test" set SleepTime to 3000, which is 3 seconds so that it is easier to follow, whats happent or 100 in normal operation. This led display shows when the machine is in closeto position, and when it is zero. This is the start button for toolzero xy. Move X to closeto position entered high feed rate and compensate for the chosen center or edge or special and do the same with Y. Then it move X to Toolzero and then Y. Then X and Y is in toolzero compensated for edge center or special. 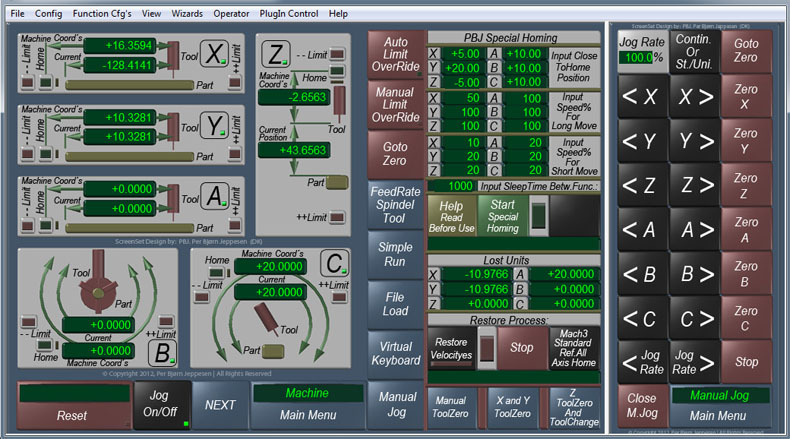 In this ScreenSet all functions from MACH3 standard retains intact there is only altered in design, layout and the way it is divided into, in addition there is made a lot of new screens and features the following screens contain all the standard features but are divided on multiple screens that make it more manageable and allows you to take full advantage of touchscreens. 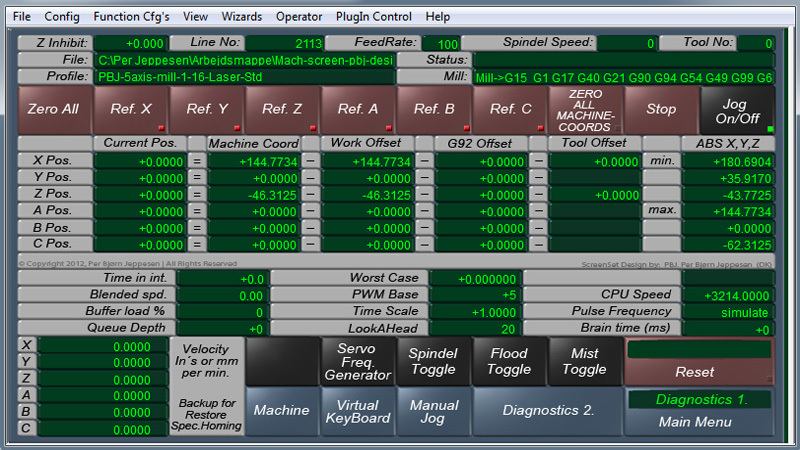 ProgramRun on Mach3 standard screenset contains both functions to load files, feed rate, spindle speed and running a file. This I have choices to divide into three screens, because here it makes sense to divide it. ProgramRun is then turned into three screen called File Load Menu/Screen + Program Run Menu/Screen + Feed Rate, Spindle, Tool menu/Screen. This also provides a nice overview especially for beginners. On most Screens or Screens where appropriate, there is a bar at the top of screen that contains all the important and useful information. Personally, I prefer the light gray to provide a better and clear picture of your drawing than the dark blue default color. To change Toolpath colors go to: Config > Toolpath. 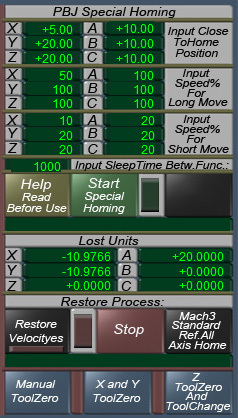 The first picture shows the default settings, the next the green color in the "feed rate G1 color" and the last the light gray color in "feed rate G1 color"
Note: this is not settings that are in the screenset but settings you have to make in MACH3 config settings. Some new mach3 users asking about the general settings in mach3 have changed. There are no changes in these, they are similar in all Screensets. As can be seen in the above image. This menu contains all functions related to load a file, there is also the new features Toolpath navigation as described in simple run, the new function Stop To Be Continued And Continue Unfinished Job which will be described later in this guide. 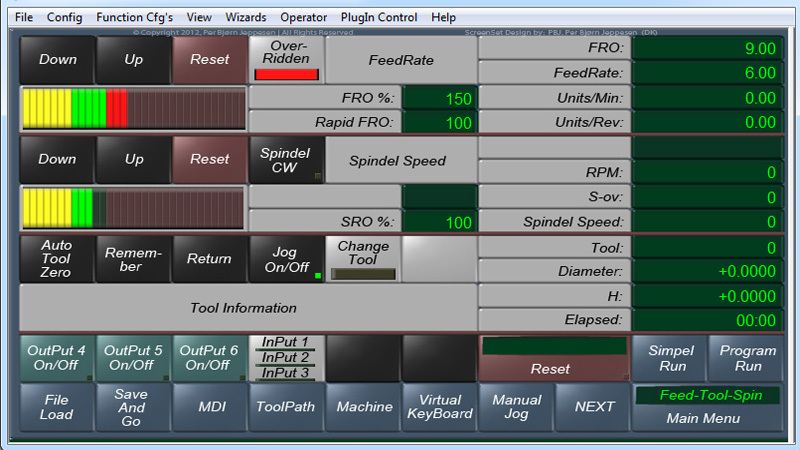 In addition to all features for Feed Rate, Tool infornation and Spindle there are also three output toggle buttons so you can test the external spindle speed. And a Led scala which is activated when you press the up or down. 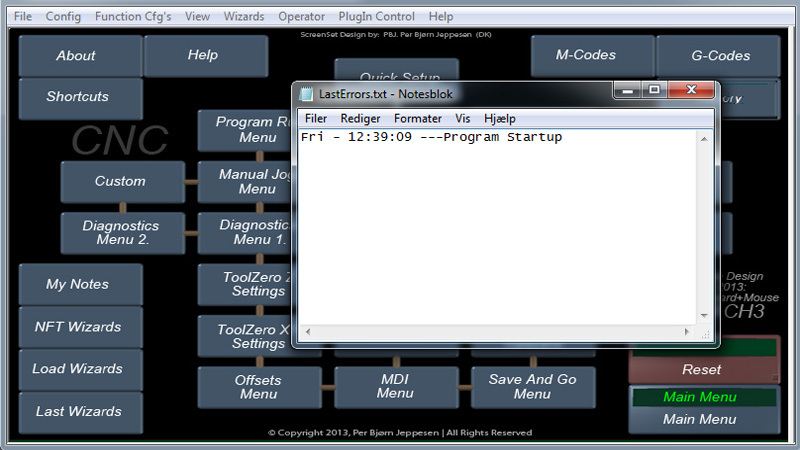 ProgramRun screen contains all functions to run a program/Job and the new features ToolPath navigation, Stop To Be Continued, and Output Toggle as described earlier. 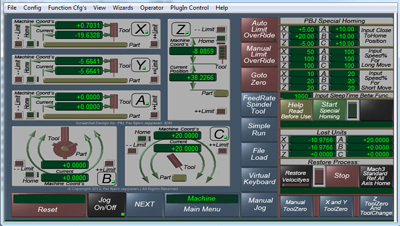 ToolPath screen contains standard functions for this screen as well as the new features ToolPath navigation, and Output Toggle as described previously. 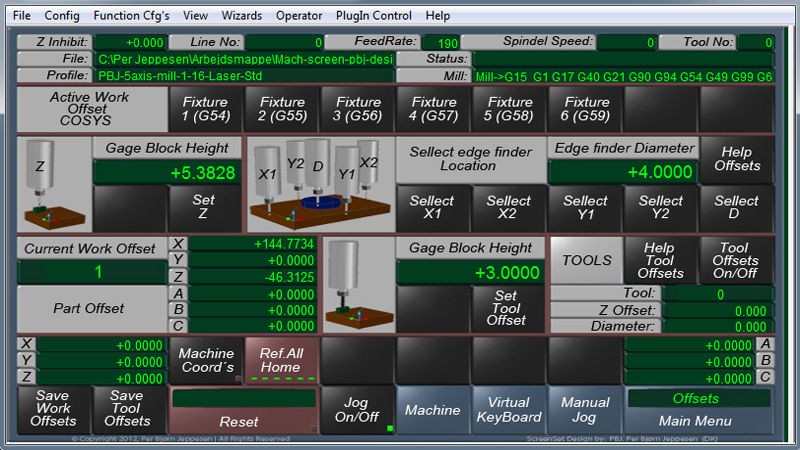 MDI screen contains standard functions for this screen as well as the new feature ToolPath Navigation. Offset screen it is only layout or design there is new. The original standard Setting screen is here due to space divided into two Setting 1 and Setting 2 it also provides plenty of space for any new setting functions of the futures. The original standard Diagnostic screen is here due to space divided into two Diagnostic 1 and Diagnostic 2 all led are on Diagnostic 2. The only functional terms is new here is There will be a backup of velocityes from spec.homing and a button for zero all machinecoords. I've added a button to reset all Machine coords (Note this is not Current coords). This feature is especially good if you run tests in offline or on a PC which is not connected to a machine, and thus has no limit or homing switch there can provide input. 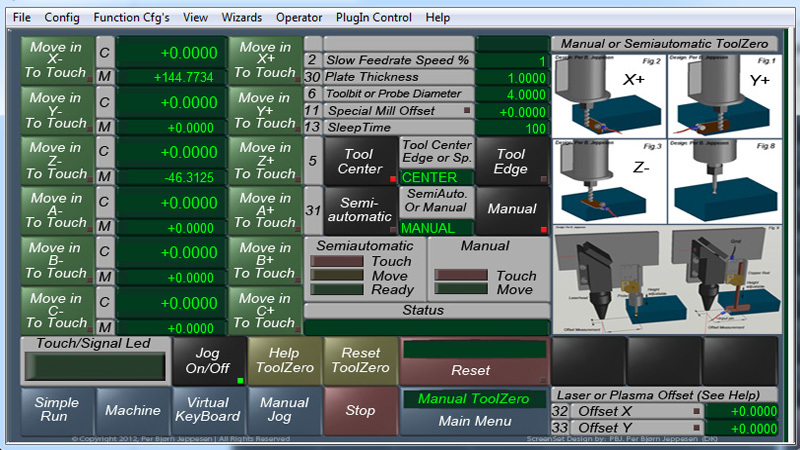 This will often mean that the toolpath display get very out of focus if machinecoords is high. There is also made a blank screen for any custom functions. 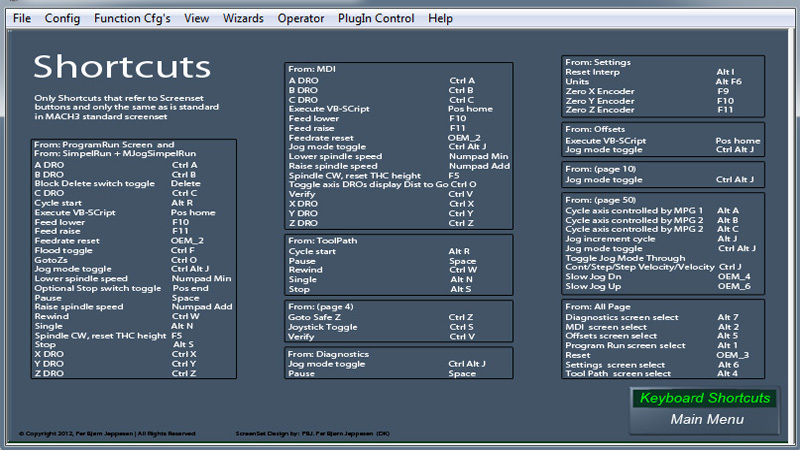 This screenset can of course also be used on standard monitor, keyboard and mouse so there is also a menu that shows all the keyboard shortcuts. History menu is of course also available from the Main Menu. 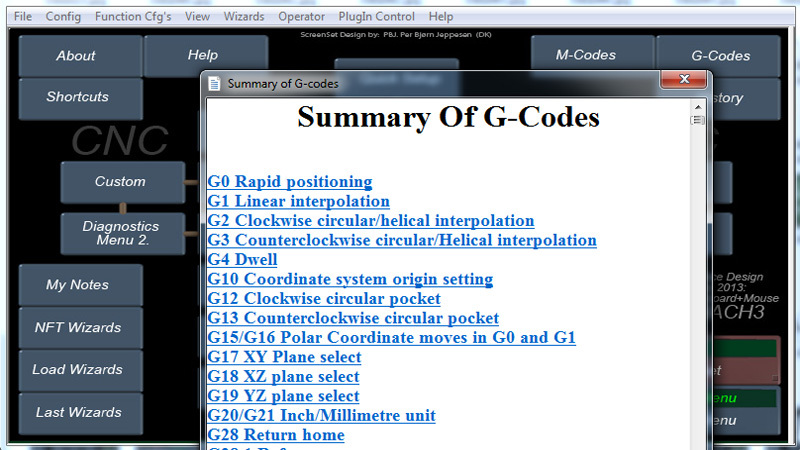 G-Code menu is of course also available from the Main Menu. 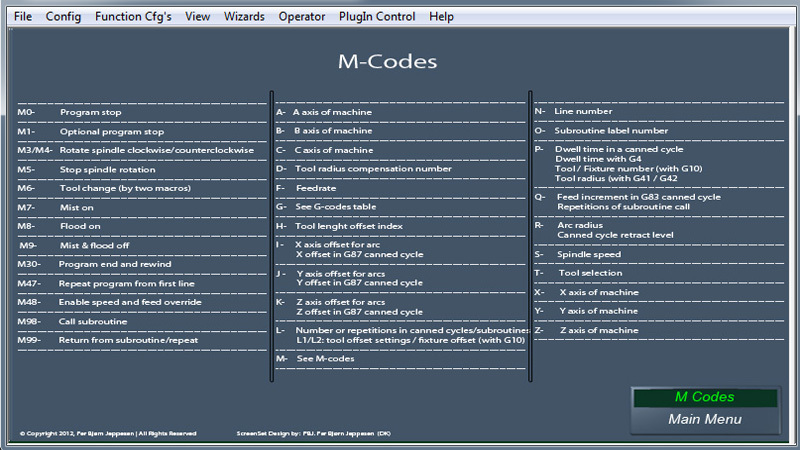 There is of course also a screen with M-Codes. By using this screenset you agree with the following: Mach3 and with this screenset are used for many different machines from large pro. machines to small hobby machines. And there are many settings and many different ways to use this software. Therefore, it is at your own risk to use this screenset I can not give any guarantees for any human injury or mechanical or electrical damage caused by this screenset and it is therefore at your own risk to use it. It is your responsibility to make small tests in low speed and be within an emergency stop range to see how codes and features work on your system. It has been a mammoth task to make this screenset and I can not exclude that there are small errors in some codes to the new features, although screenset has been tested in many configurations, if this is the case, I will of course correct these errors and an update will be available. 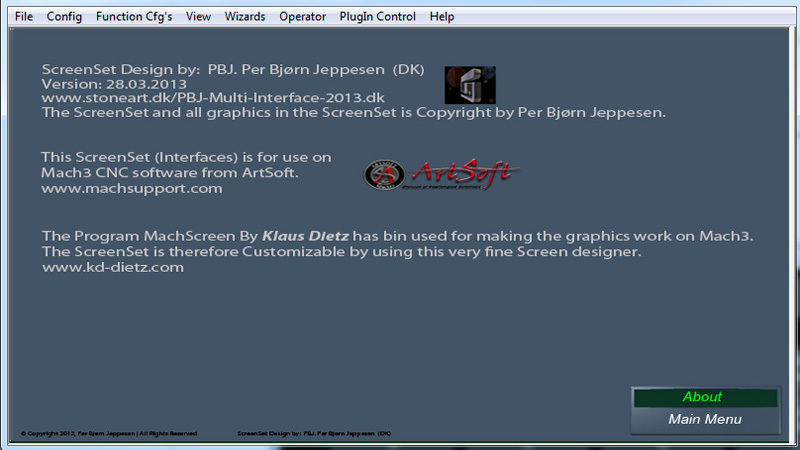 Download the Zip file named PBJScreenSet2013Ver001.zip to your harddisk eg. desktop. 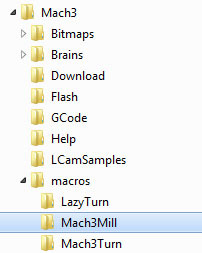 The zip file contains 3 folders named: Mach3MainFolder and Mach3BitmapFolder and Mach3MacroFolder. Copy all FILES and FOLDERS there is in the folder Mach3MainFolder and Paste them to the Mach3 MAIN folder but only the files and folders there is in the folder, NOT the folder Mach3MainFolder. Copy all FILES from the folder Mach3MacroFolder and Paste them to the Mach3> macros>(Yourprofile) folder, only the files, not the the folder. If you are not sure which one, then copy to all the folders in the macros folder. Copy all FOLDERS from the folder Mach3BitmapFolder and Paste Them individually to Mach3 Bitmaps folder. But only the folders there is in the folder, NOT the folder Mach3BitmapFolder. 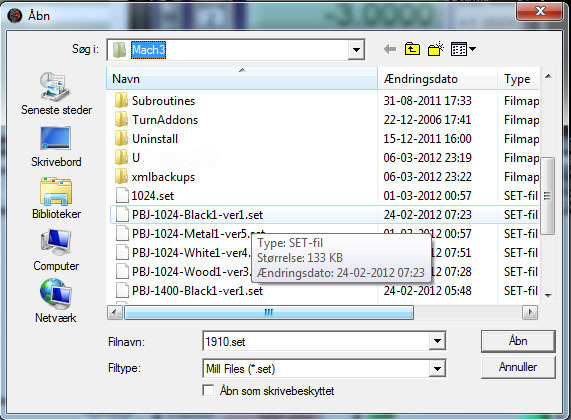 2: Double click the SET file you want to use, Files ending with .set is different ScreenSets (Interfaces). 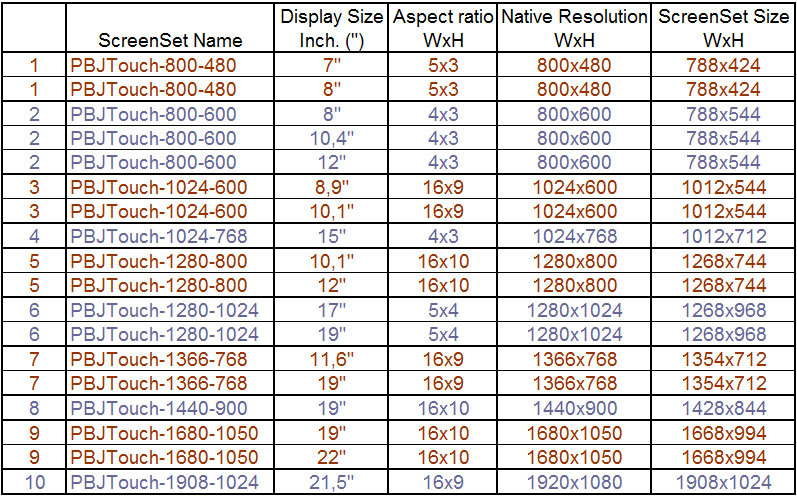 To get the absolute best graphics, it is very important that you choose the right NATIVE resolution for your display. In the documentation for all displays you will be able to see which resolution is the native resolution for your display. Then it is important to select this resolution in Windows software. In documentation for many flat panels is described both Native Resolution and Max Resolution but you are not getting perfect results by using Max Resolution. So you are stuck on the Native Resolution. When this is done you have to choose the right ScreenSet (.set) file. Because there are many resolutions, I have have had to make 10 ScreenSet each with different graphics sizes, to cover the most commonly used resolutions are being used in the market. But note that an eg. 40 "monitor can have a resolution of 1920x1080 and a 7" monitor can also have a resolution of 1920x1080 so it depends on your monitor's native resolution. So in fact covers the 10 set many more monitor than shown in the diagram below. As an example, the default screenset from Mach3 has only one resolution. In the above chart, you can see some of the resolutions the different screenset covers. As you can see, the same resolution might be the same on eg. both a 7" and a 8" display and the same screenset thereby covering both. In the name of screenset or set file shows the resolution, so choose the right. If you have a special display that is not listed, choose the closest and choose that which is slightly smaller than the resolution of your screen. If the difference is very small, in some cases compensating in Mach3 settings is possible. Please note all this is only in relation to the perfect world where screen size, resolution and screenset size goes up to a higher level. Ex. on a 19 inch screen, all set in sizes below the current resolution fit but set might not filling display perfectly to the edge all the way but you will always be able to find a set that fits well with your screen where the graphics are perfect. So try the differant sizes. Below you can open different size, please note that you open them in the browser and it is only screenshot so it's not the perfect view but it gives an idea of ​​the different layouts in different resolutions/sizes. MACH3 default screen control setting looks like this. HOWEVER drivers and software and displays keep getting better at solving this problem so if you have a display that falls outside try the different settings and different screenset included with this purchase. You can test the differen setting in MACH3 with ScreenSet you are using now and see the difference. Note: This setting is saved in the XML file (machine file) and you must make this setting again if you switch to another XML file or profile.